In June 2015, I ventured on a 3-week solo hike along Northern Spain starting in Irún (Basque Country) and finishing in Oviedo (Asturias). 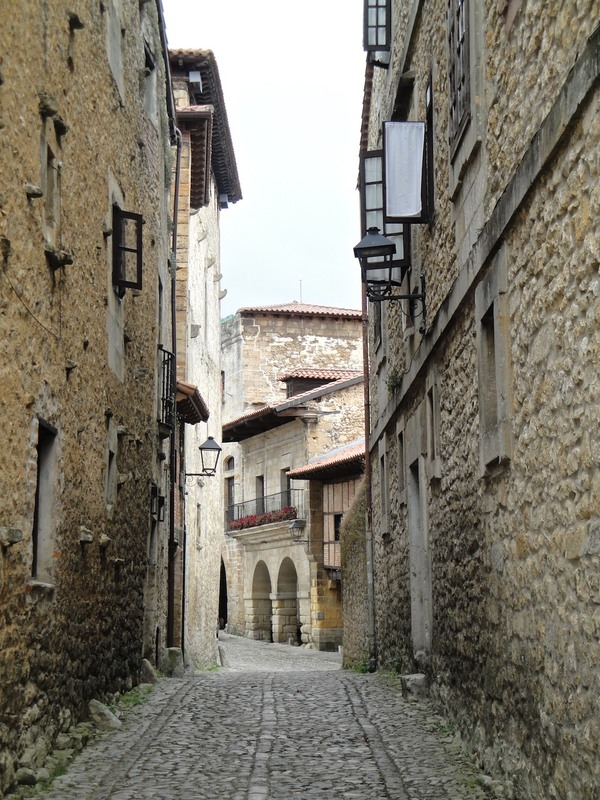 This is the third post in my Camino series – click here if you missed the first and/or second post! 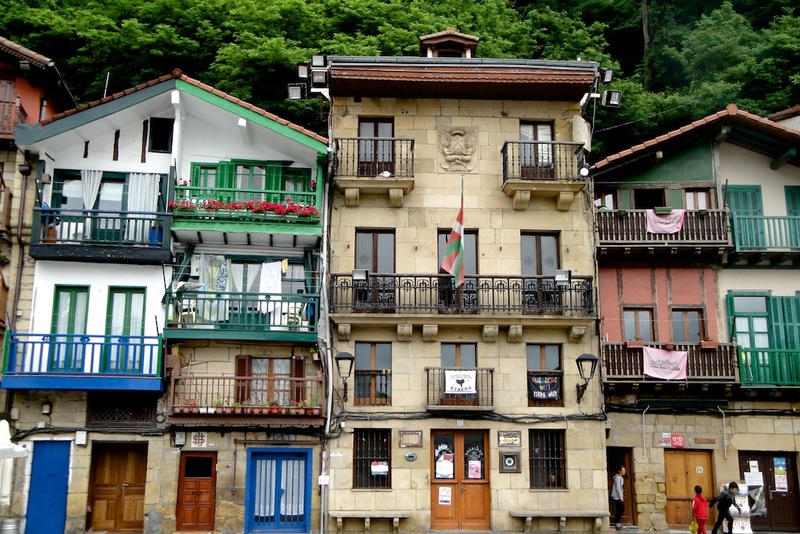 On my 16th day, I kicked-off in Serdio (Cantabria) at 7:45 AM (which, admittedly, wasn’t even that early) and arrived in Llanes (Asturias) more than 12 hours later. It was, without any doubt, my longest day on the Camino (which also made it one of the hardest ones). But looking back, it’s also the one I remember most fondly. Maybe because I didn’t rush it. Maybe because I did it my own way – stopping to take a photo or going off the official route whenever I wanted. Or maybe because I had the perfect combination of solo and social time. 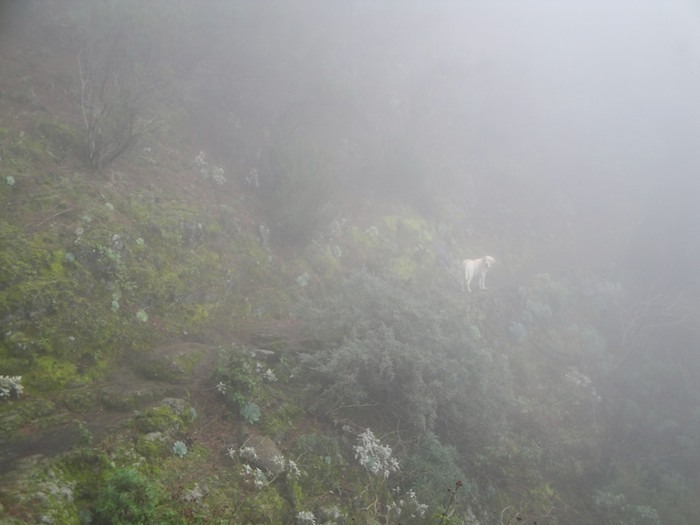 Although probably what really made my day was having a baby goat following us along the way. I walked slow and took in as much from the landscape as I could. 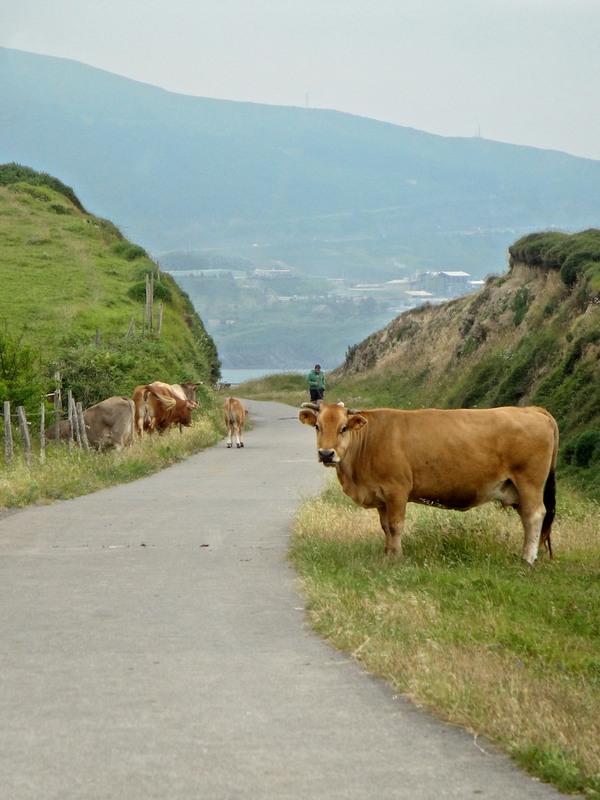 Eventually, my Camino family split for the day and I found myself in a not-so-well-marked coastal area on my own – doubting my own orientation skills. Soon enough, though, I saw Klaus (do you remember him? ): at that point, I knew I was at least going in the right direction. 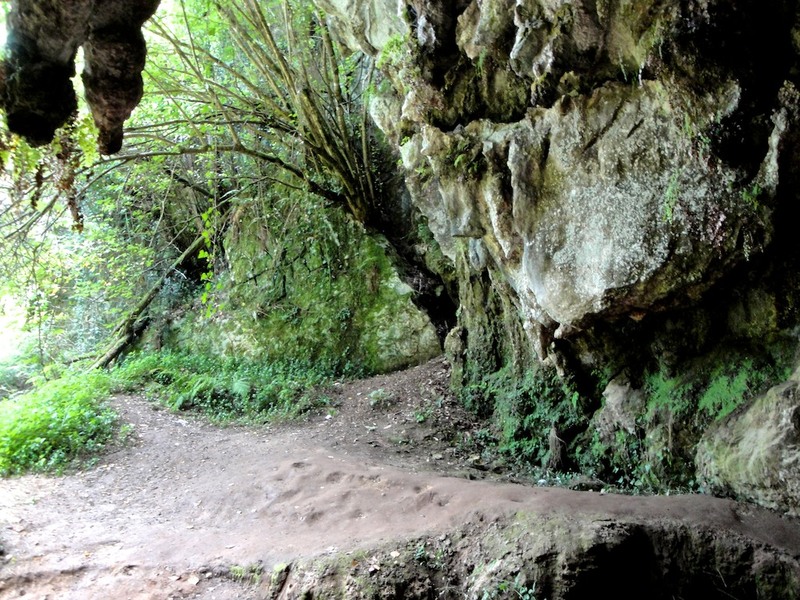 Shortly after, I was caught up by two Germans doctors and an English girl – with whom I explored hidden caves (how cool is that?) 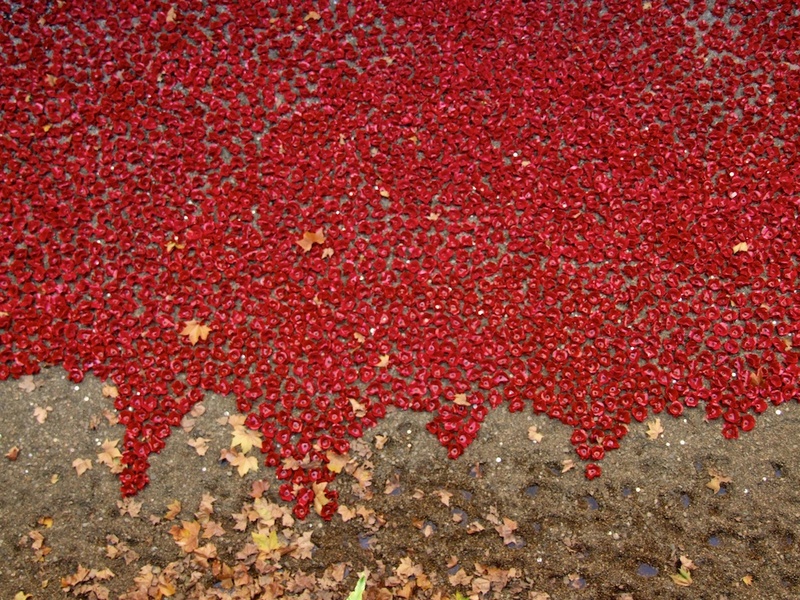 and had one too many sidras (cider) in Buelna. Later in the afternoon, outside a tiny market in Pendueles, I met a Spanish peregrino who soon became my companion for the rest of the afternoon to Llanes. I walked about 38km on that day. I fell on my face when trying to climb a passage and got caught under drizzly rain. I never felt so much pain in my feet and honestly doubted I would ever get to Llanes in one piece. 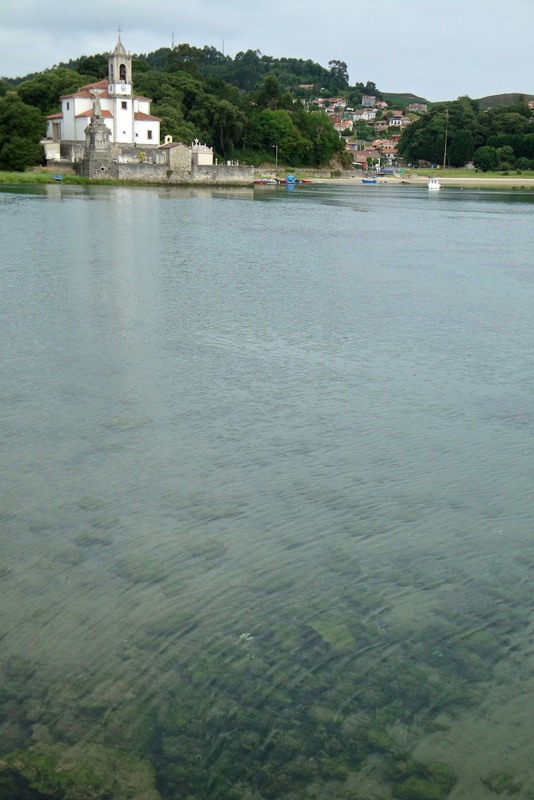 Ultimately, I almost cried when I was informed that the entire city of Llanes was booked out that night (and we were suggested to continue walking! another 5km! are they crazy?). But somehow, it all worked out. I found a hotel room (the very last one) – and even got a pilgrim discount. I was on some kind of tiredness-fuelled energy high that even got me out of that lovely room to have more celebratory sidra that night. 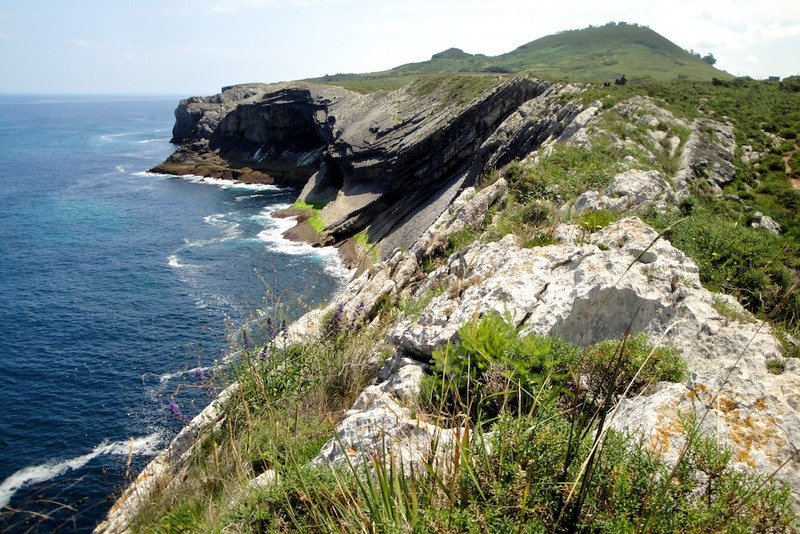 While I shared my pictures of caves, rugged coastlines, green hills and bird-eye view of Llanes I kept on thinking to myself: wow, I actually did it! So it’s no surprise that I decided to take the next day off walking. 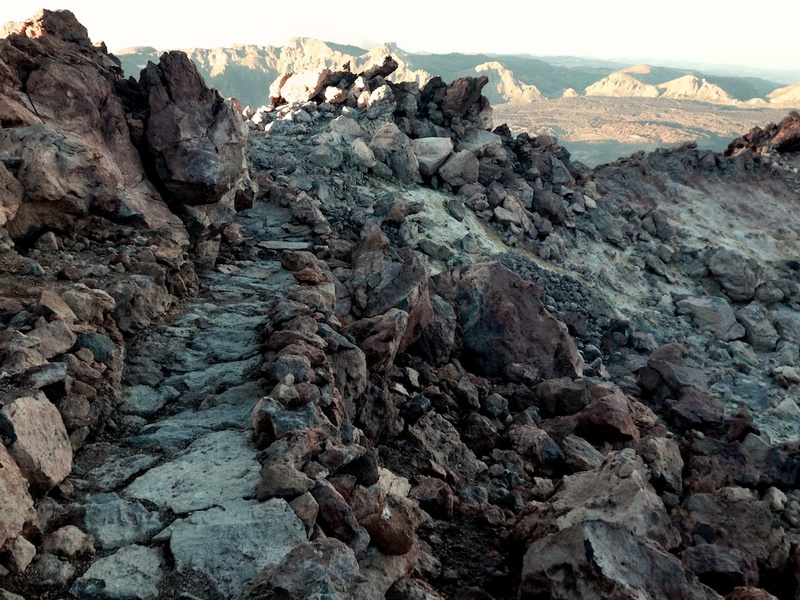 Or at least, off long-distance trekking – as, for some reason, I just couldn’t sit still. 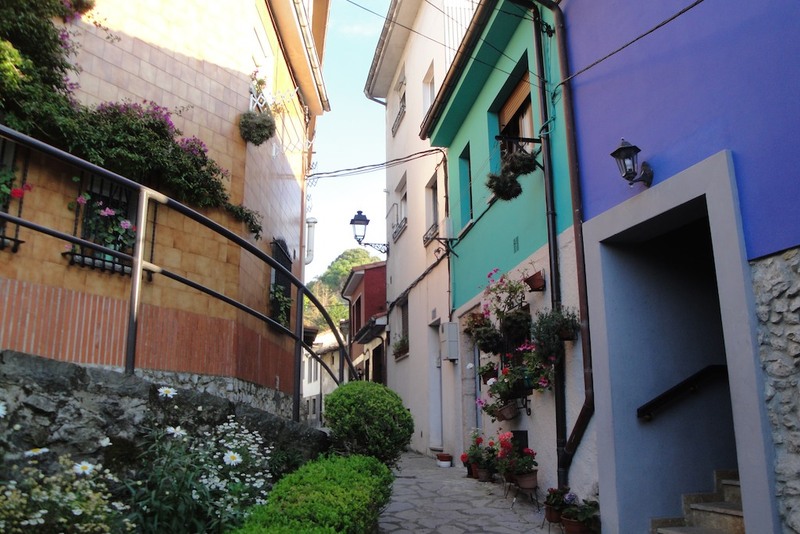 After wandering through the streets of beautiful Llanes (above), I headed off along the coastline to the next small town with an albergue (Po). And then, on to the next one (Celorio). 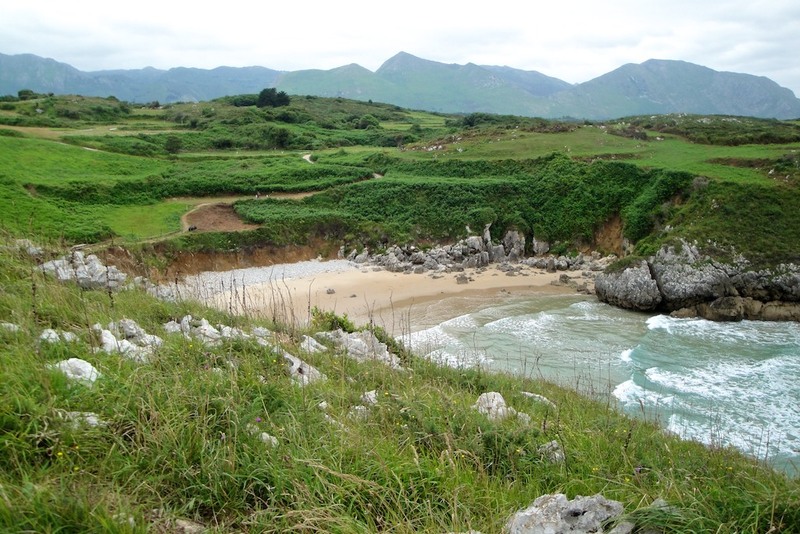 The entire Concejo de Llanes has an incredible amount of beautiful natural beaches surrounded by luscious green hills. 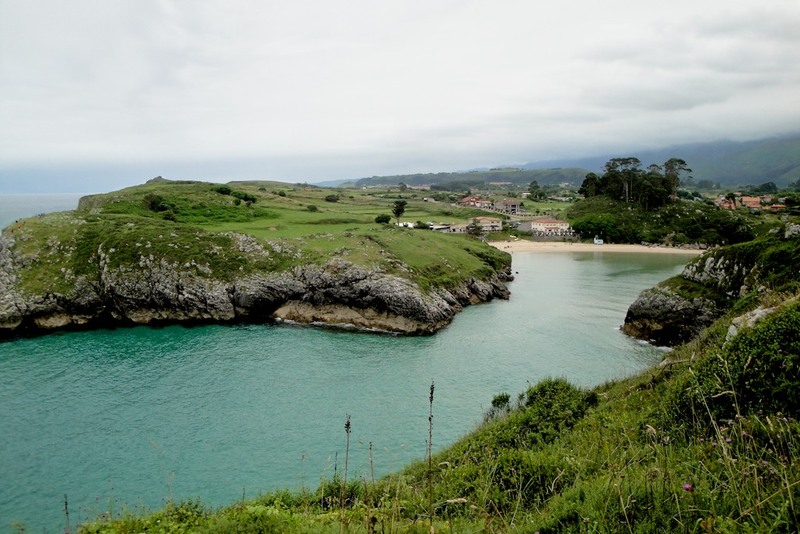 I’m determined to return to Llanes next summer for a longer period just to spend more time exploring the coast! The walk to Ribadesella on day 18 felt surprisingly easy! 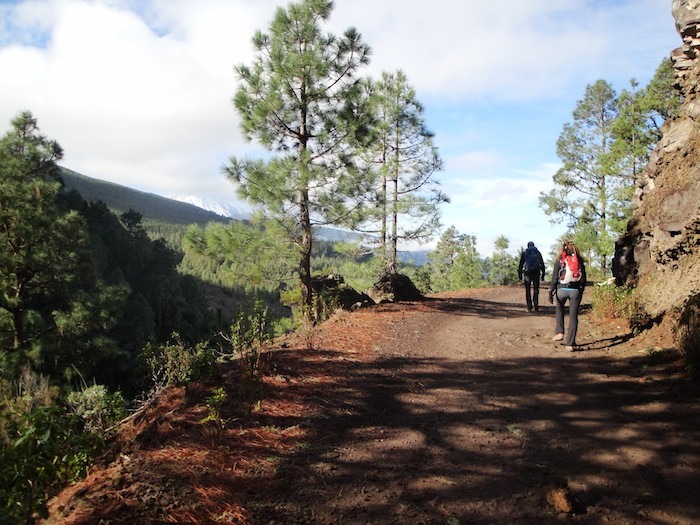 Granted, there was hardly any hight difference and the path was a rather balanced mix of road and trail – leading through small villages, grassy fields and great cultural sights (such as the above of the Iglesia de Nuestra Señora de los Dolores in Barro). My favourite bit of this day was, without doubt, the entrance into Ribadesella through the colourful old fishers town of El Portiellu. 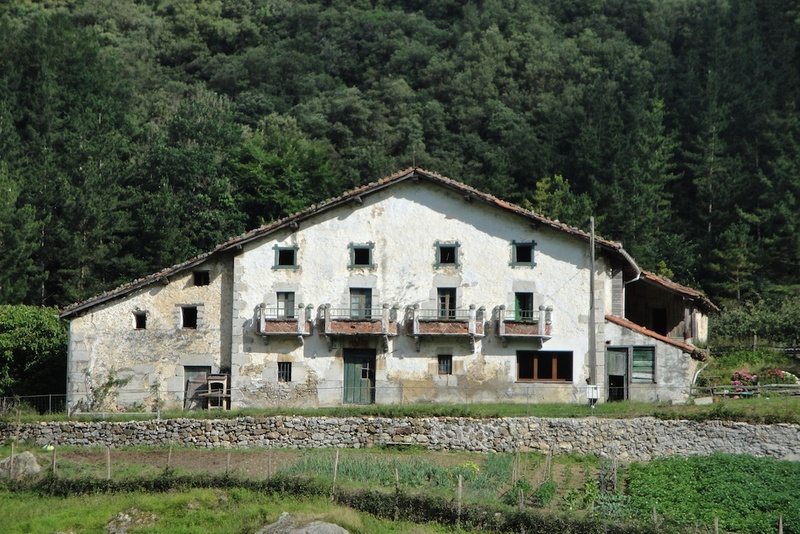 My Camino family split in Llanes – so at the time we reached Ribadesella, only 3 of us were left. You would think that having to say goodbye to people you’ve only met 2 weeks ago would be easy, but when you’ve been through hell and heaven on the Camino, your relationship to those around you is intensified. As my deadline and destination goal was approaching as well, I felt a bit blue (for the lack of a better word). 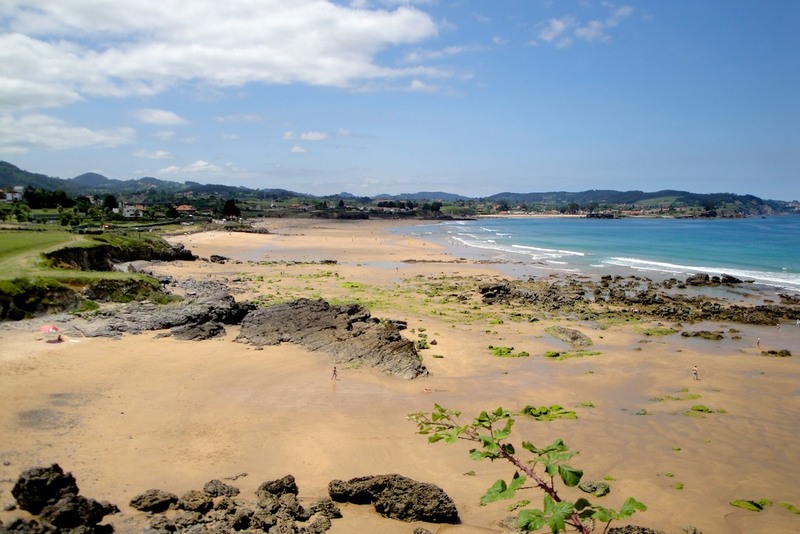 On the 19th day, we walked roughly 20km to Colunga – a big part of it along the Camino Real, which covers the local beaches and surrounding hills. It was a beautiful day to walk – not too hot, not too cold (although the latter had never really been the issue, really!). 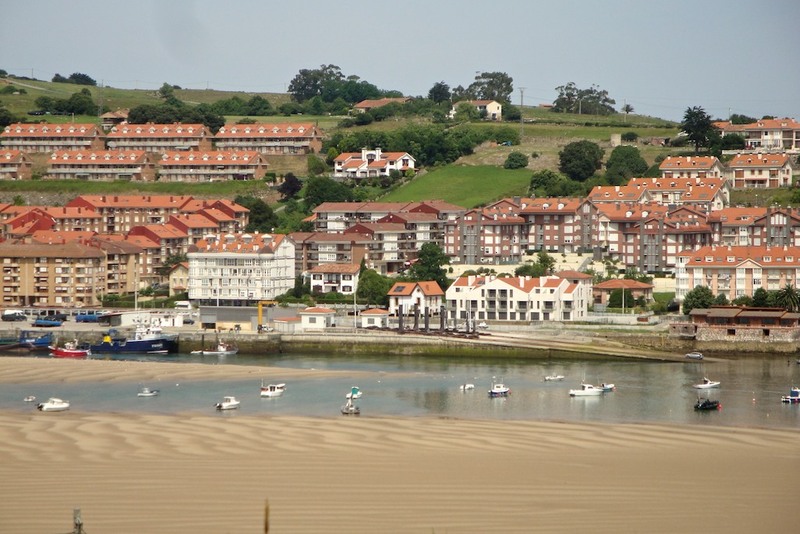 While sitting in a beach café in La Isla with Sara, we overheard a group of women discussing the disappearance of a female pilgrim on the Camino Francés earlier this year. We were both aware of this event (in fact, Sara had packed a pepper spray can in her backpack), but it didn’t stop us from going solo. Nor did it stop many other female travellers we crossed paths with over the past 3 weeks. It made us realise that there hadn’t been a moment when we felt in danger. Yes, terrible things happen sometimes. When walking on a less-frequented paths, I was always alert and intuitive and usually knew how far/close the next group of pilgrims were. And by doing this, I always felt safe. 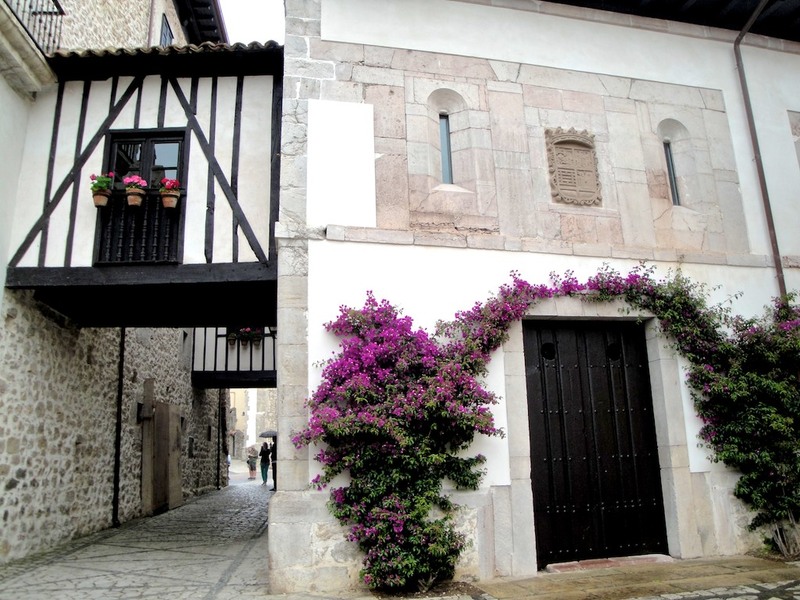 On my last day as part of (what was left of) my Camino family, we walked 18km to Villaviciosa – the apple capital of Spain. Yes, there was certainly lots of cider! 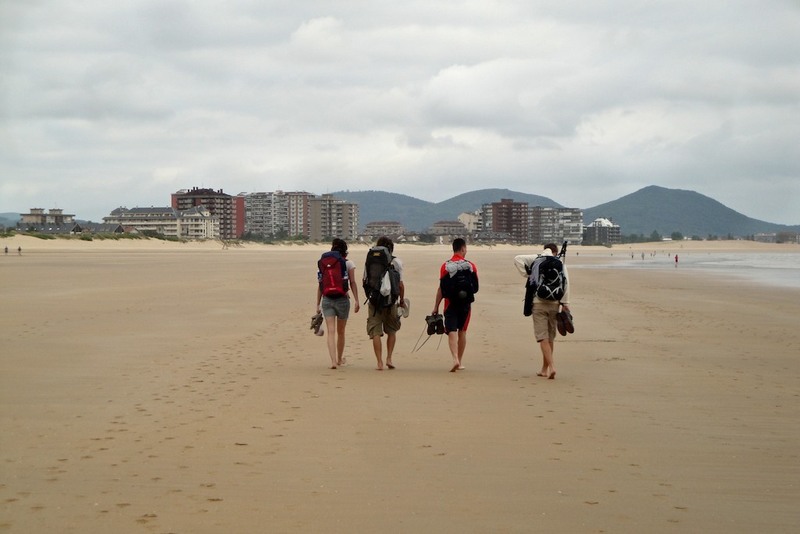 We reminisced about the many stories we collected along our Camino and remembered all the people we had met. We promised to keep in touch (thanks, Facebook!) and to always remember this experience. 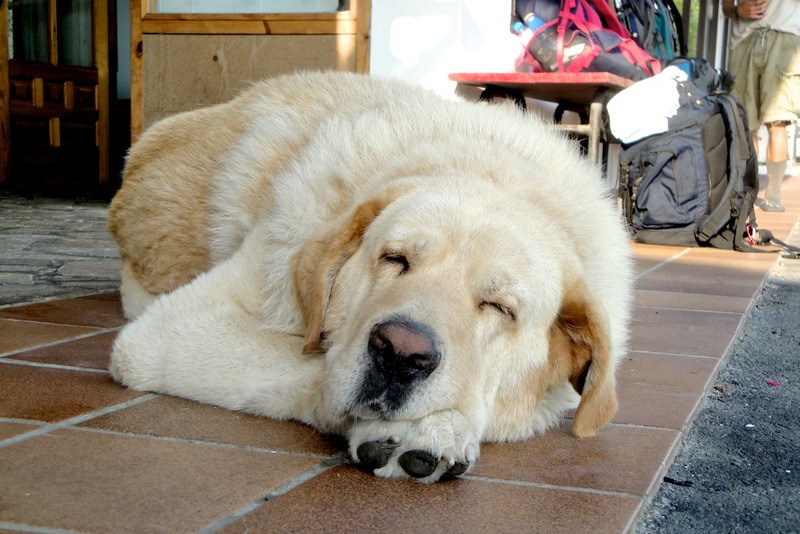 As my final Camino day arrived, I was equally excited and sort of heart-broken. I actually didn’t really want this adventure to end! 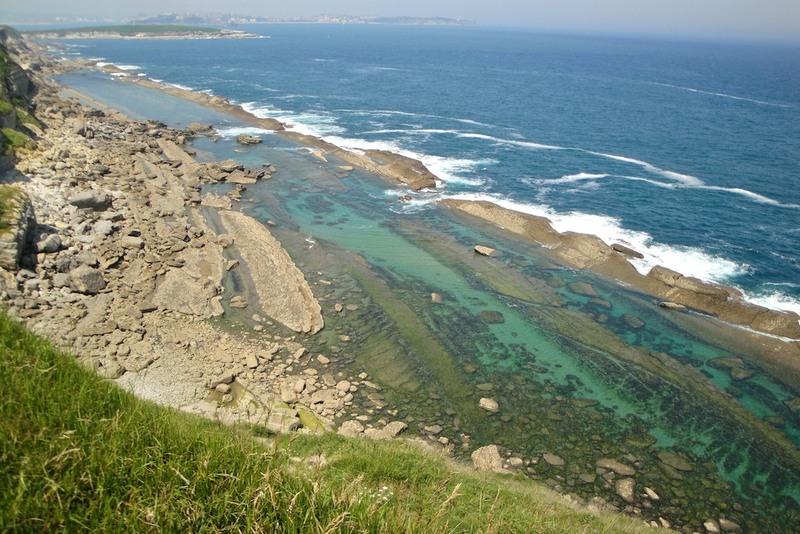 Soon after leaving Villanueva, I reached the point at which the Camino divided in two parts: on the right, it would continue to Gijón along the Camino del Norte, and on the left, it would route towards Oviedo – the start of the Camino Primitivo. 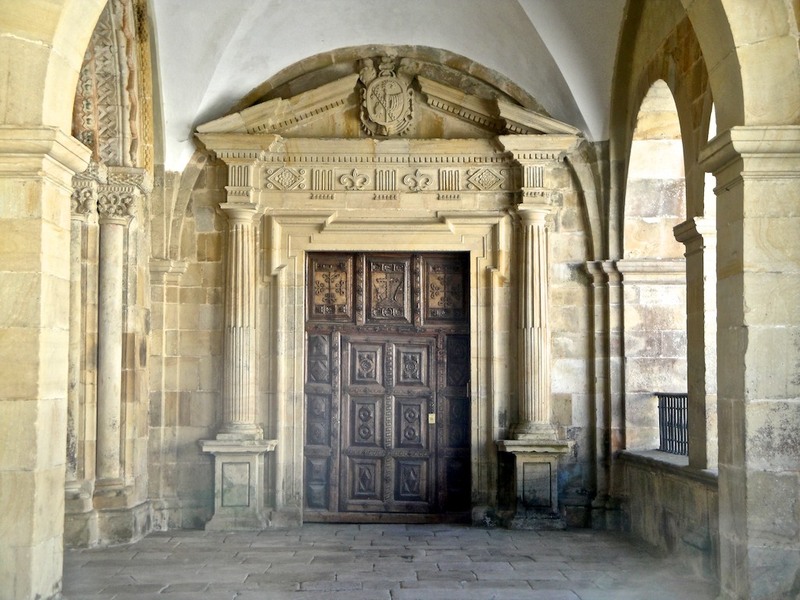 Towards Oviedo, I came across de impressive pre-romanesque Monasterio de San Salvador de Valdediós (below). After the Monastery, the path went uphill to Alto de la Campa (photo below) – constantly allowing me to peek over the Valley from different angles. 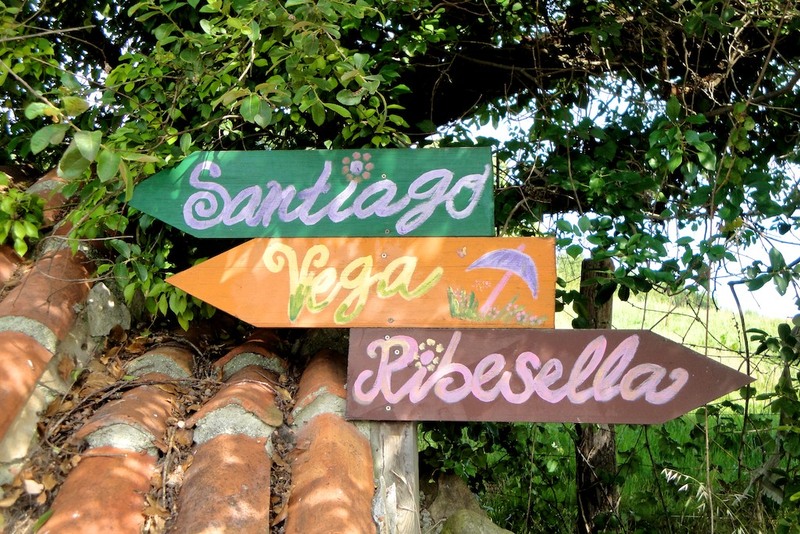 I had heard that, on the Camino Primitivo, signs were less frequent and sometimes a bit confusing. True – In fact, I even came across conflicting signs! But somehow, with a bit of intuition, I didn’t get lost on this rather solitary path. During the whole day I only came across 2 fellow pilgrims, so I guess most of them decide to continue along the Camino del Norte to Gijón instead! There’s really no right or wrong way of walking it. No age, belief or physical requirements. There’s no minimum distance and no real schedule (but the one you build up in your head). And there’s nobody to impress or feel judged by (but ourselves). 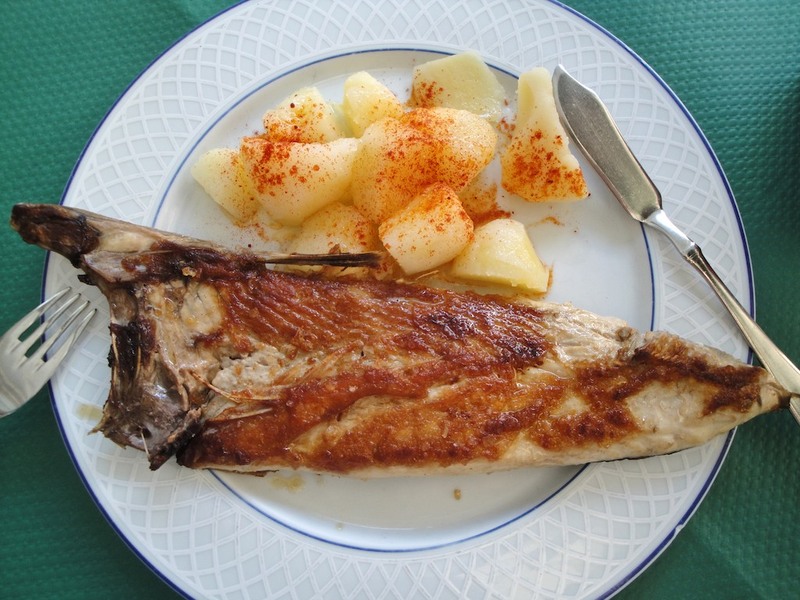 That afternoon, I arrived in Oviedo without much of a plan but to walk through the old town, explore every inch of the city and eat local bonito del norte a la plancha (below) before saying goodbye to the Camino (for now!). 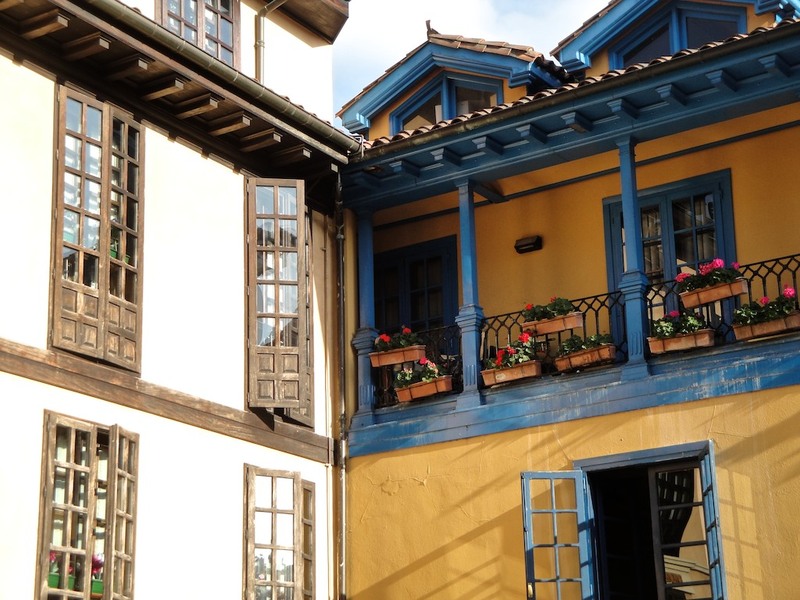 Have you been to Asturias in Spain? Putting one foot in front of the other and taking the next small step is something I’ve been doing a long time. It’s no secret that hiking is one of my favourite things to do when I travel. It’s also one of my favourite things to do on weekends. There’s something about it that just feels so liberating! I love the way walking the trail frees me from all those mundane distractions. 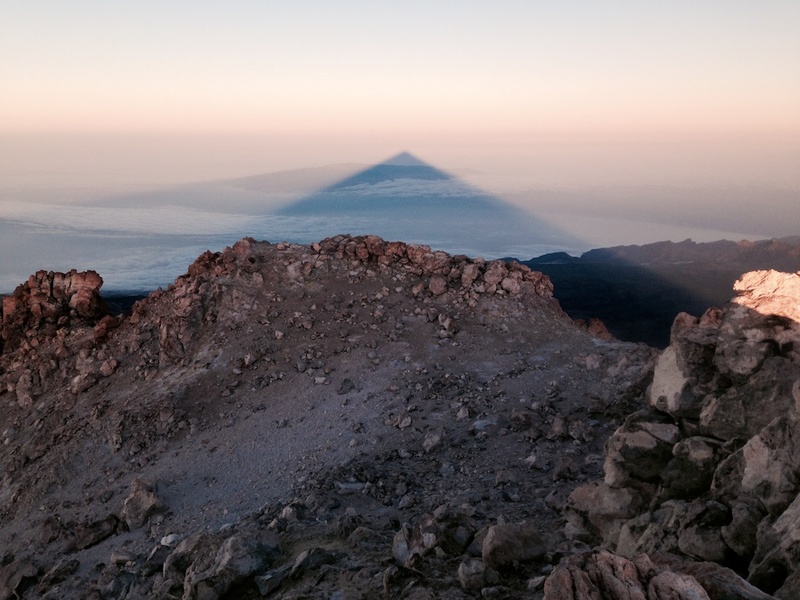 This clarity and the incredible and unexpected landscapes that I discover are the main reasons why I love trekking. So, after months of wishing, planning and asking a million questions on the Camino de Santiago, I’ve finally made plans to begin my own pilgrimage. 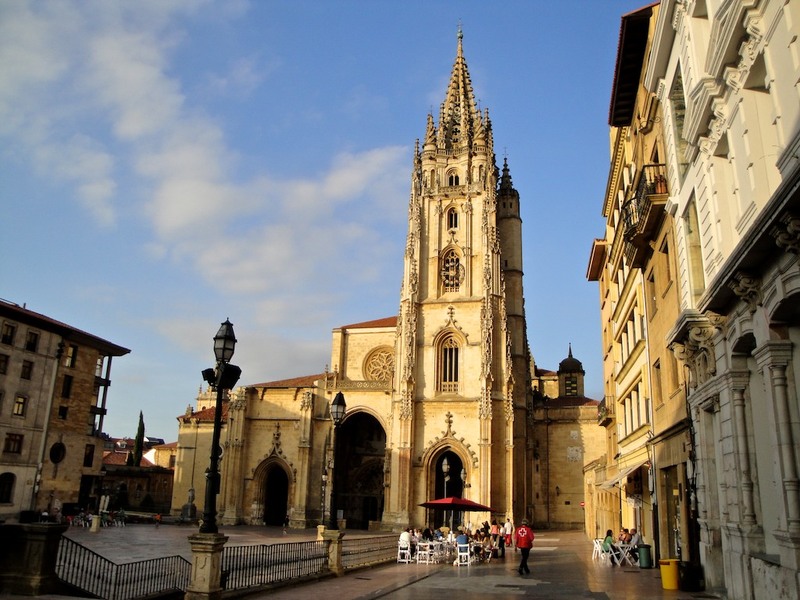 The Camino is a pilgrimage route that has existed in Spain since the IX Century, when the remains of Saint James Apostle were discovered to be buried in Santiago de Compostela. peregrinos (pilgrims) travelled to Galicia from all over Europe to see it. 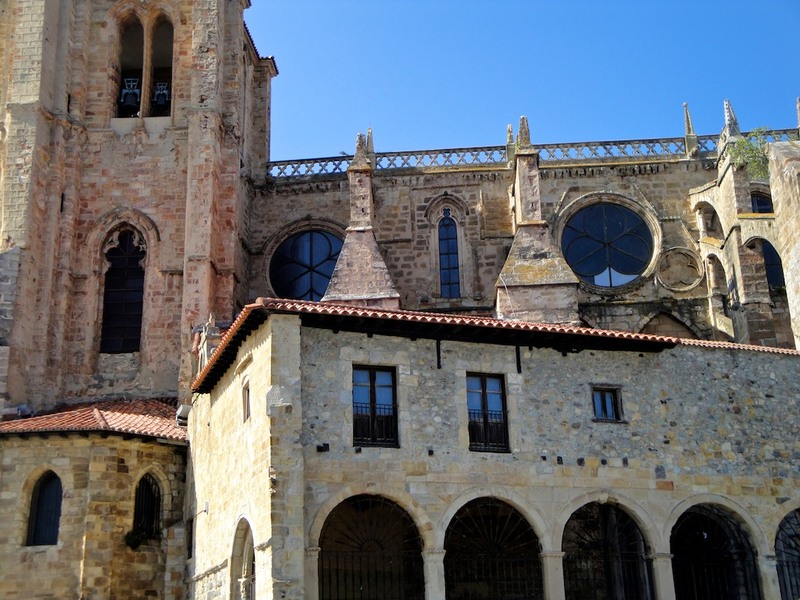 Nowadays, there’s an entire network of routes coming from all over Europe to converge at the Cathedral of Santiago de Compostela. 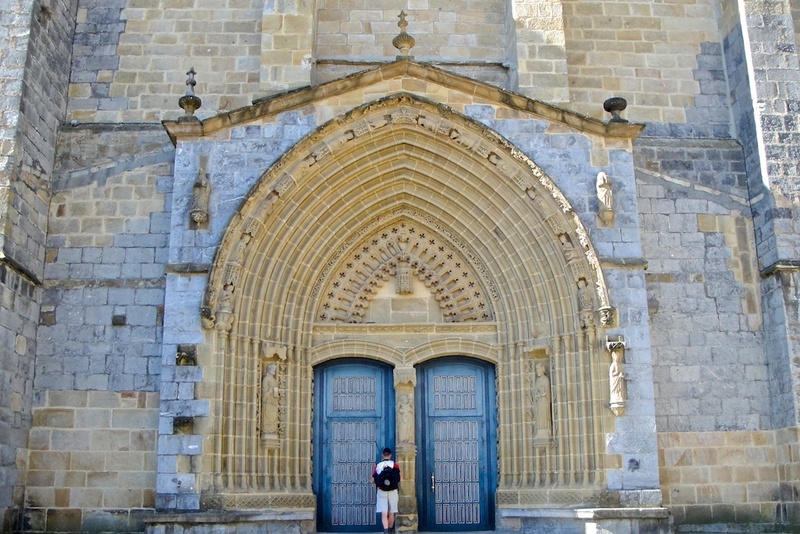 The most popular way, the Camino Francés (or French Way), was declared the first European Cutural Route by the Council of Europe in 1987 and inscribed as one of UNESCO’s World Heritage Sites in 1993. While The Camino has been the subject of many books and films, its popularity probably increased dramatically after the release of Emilio Estevez’s film, The Way, in 2012. 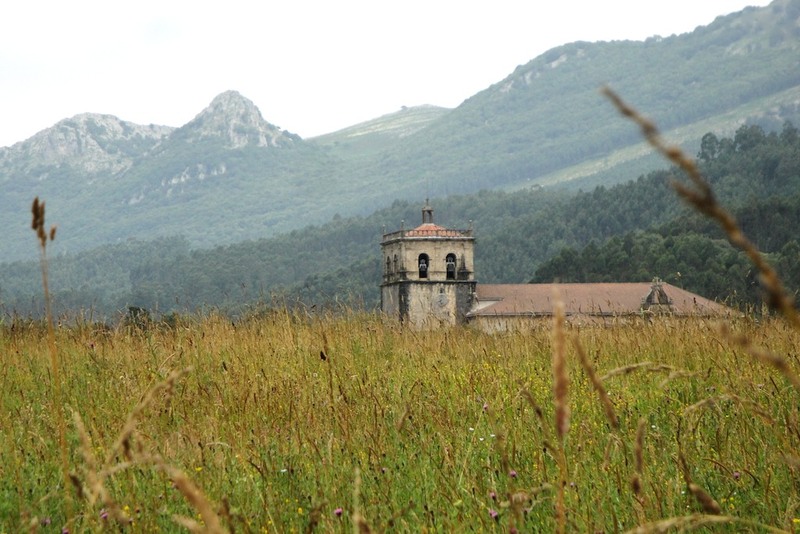 Last year, almost 250.000 pilgrims walked reached Santiago – roughly 65% choosing the Camino Francés. 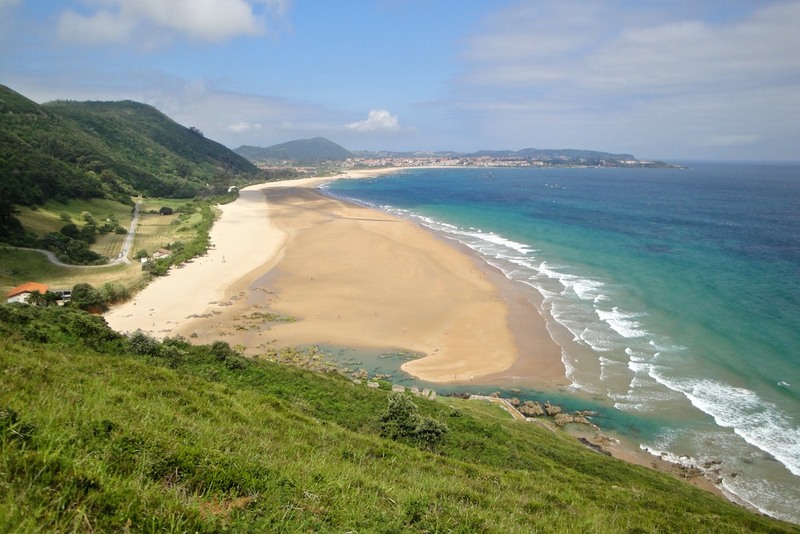 I’m doing the Camino del Norte, or Northern Way – see red route in the map above. 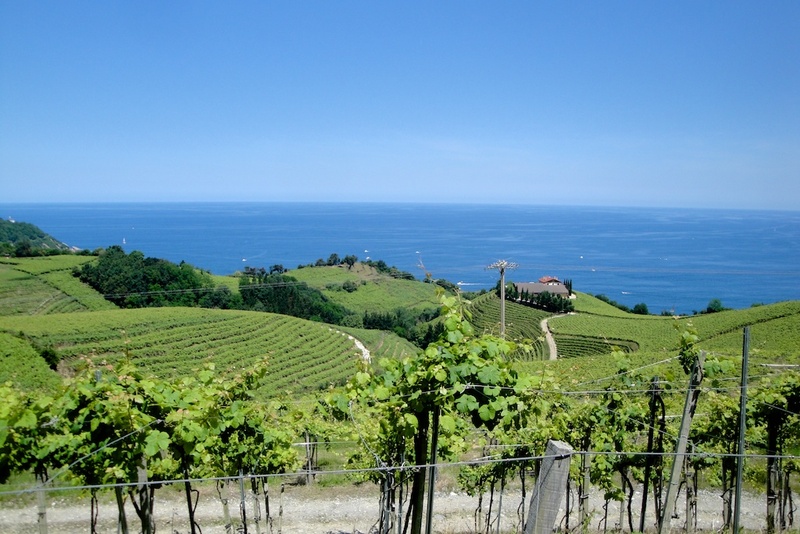 Out of all the routes – why the Camino del Norte? While significantly less-travelled and more challenging than others, everyone I’ve spoken to agrees that the landscapes are worth the challenge. 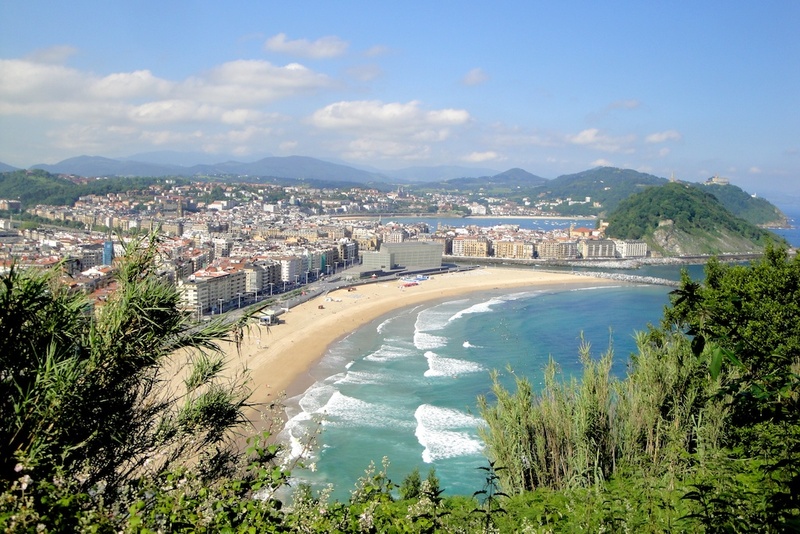 Starting in Irún (a small town in Gipuzkoa, Basque Country), the trail follows the rugged northern coast of Spain, combining coastal walks and mountain hikes. 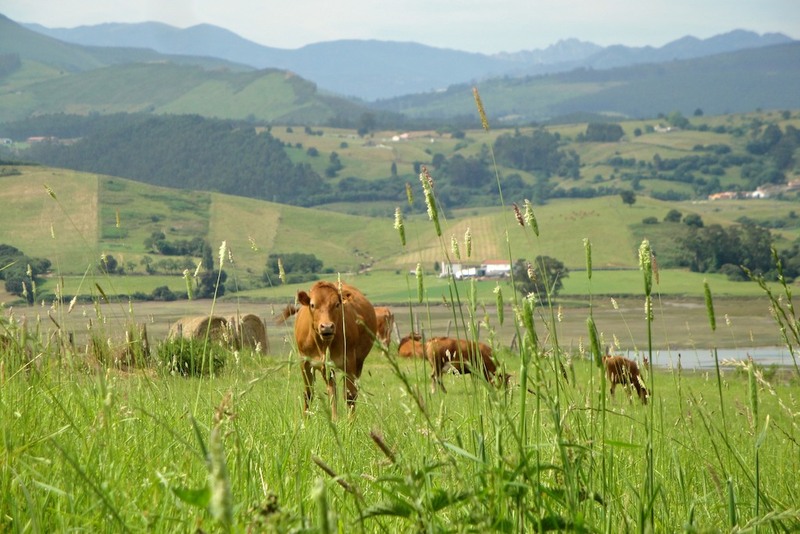 The entire route from Irún to Santiago de Compostela (Galicia) is a +800 km (roughly 500 miles) trek, which most people complete in between 30 and 40 days. The thing is: I don’t have so much time available on one go (in fact – not many people do! ), so I’m planning to complete my pilgrimage in smaller episodes. 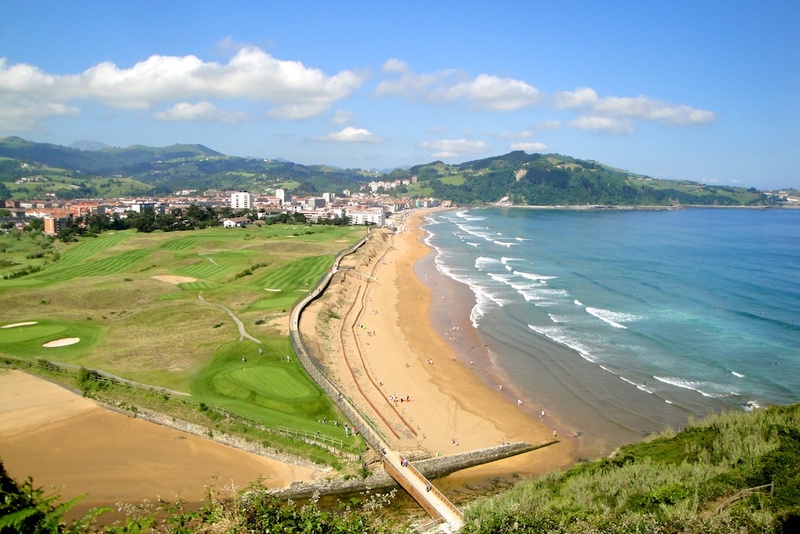 This time, I’m planning to trek from Irún to Oviedo (roughly 490 km – or 300 miles). This might seem irrational at first: Why not start somewhere halfway to Santiago in order to reach the final destination? First and foremost, Because I’m stubborn – and really really want to, eventually, do the whole thing. 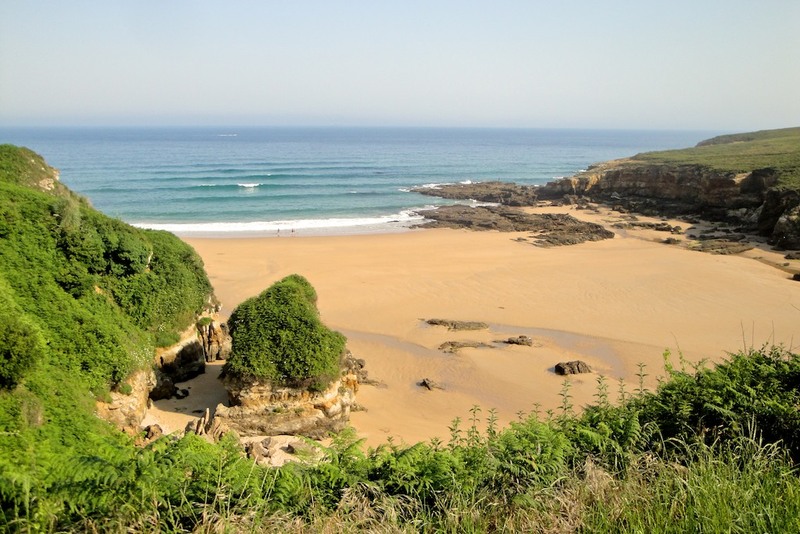 But also because it’s summer, and I am excited about seeing more of the Northern coastline – maybe even dip my battered feet into the cold Cantabrian Sea. 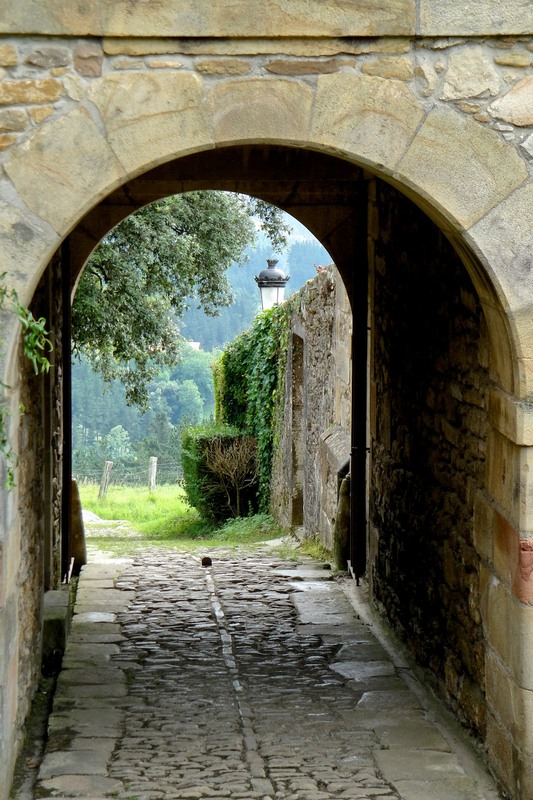 After all, the Camino is not so much about the destination, but about the journey! 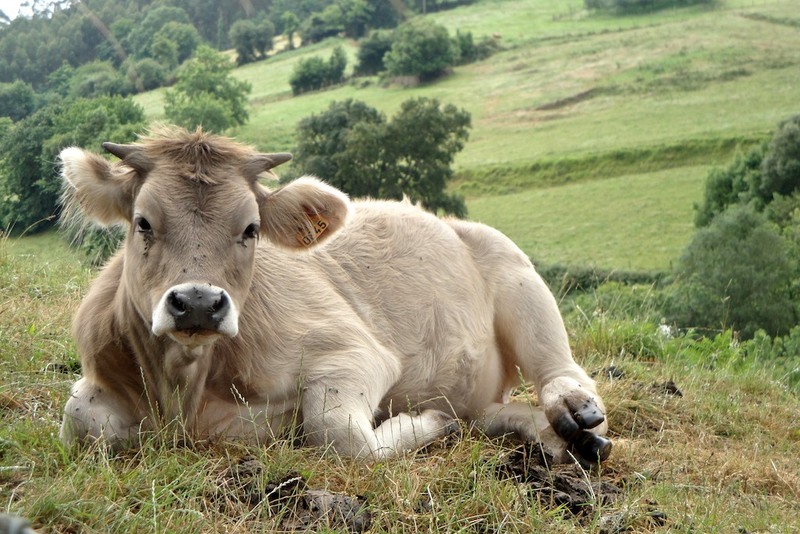 One of the many things that I love about the Camino is that there is no right and wrong way of doing it. 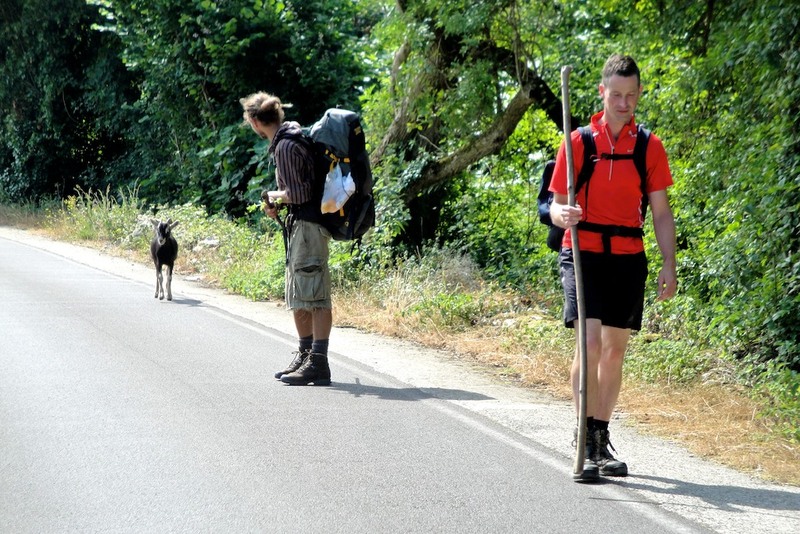 Some people walk the entire +800 km in one go, while others complete theirs by going back year after year. 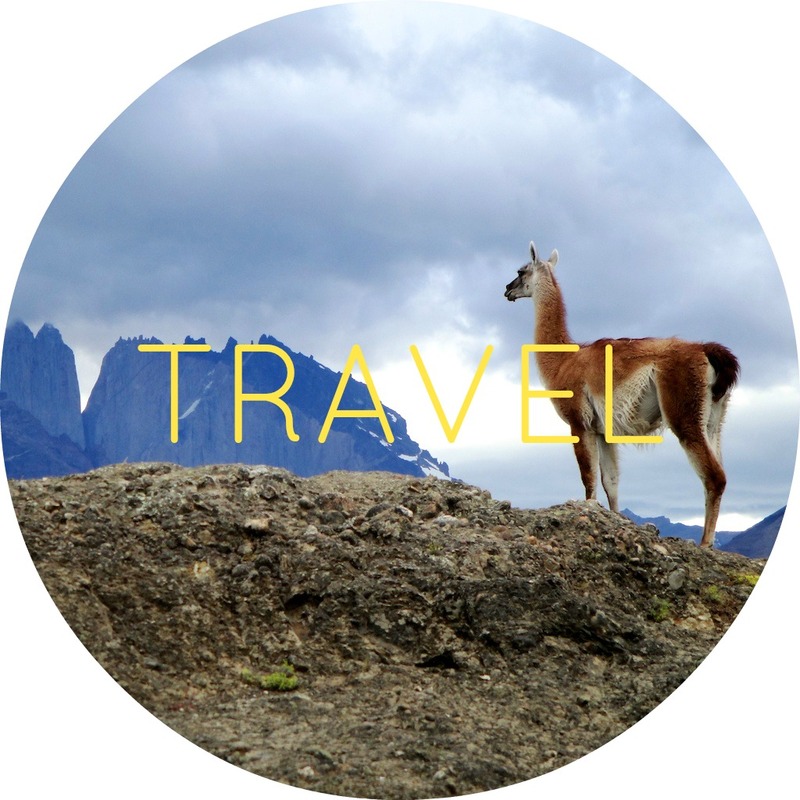 Some stay at albergues and camping sites, others book hostels and hotels on the way. Some go solo, others go in groups – heck, there are even organised tours in case you can’t convince your friends about the fun in walking +20 km per day but don’t really want to do it on your own, either. 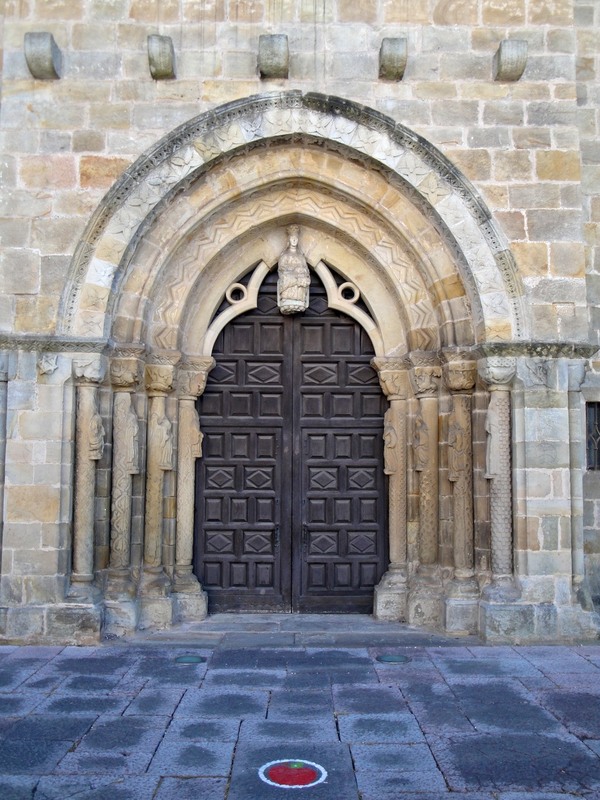 People walk the Camino for many reasons – and they’re certainly not always religious. I’ve got many little reasons to walk it. I do it for the challenge and the adventure; to get out of my comfort zone. I walk for the solitude; for the opportunity to unplug, appreciate the present moment and gain some perspective. But then, I also walk for companionship; to meet new people on the road. I am really looking forward to spending the next 3 weeks thinking of nothing else than taking the next small step! During the trek, I will be sharing live updates on Twitter and Instagram (PS: are we friends yet? ), so follow along! 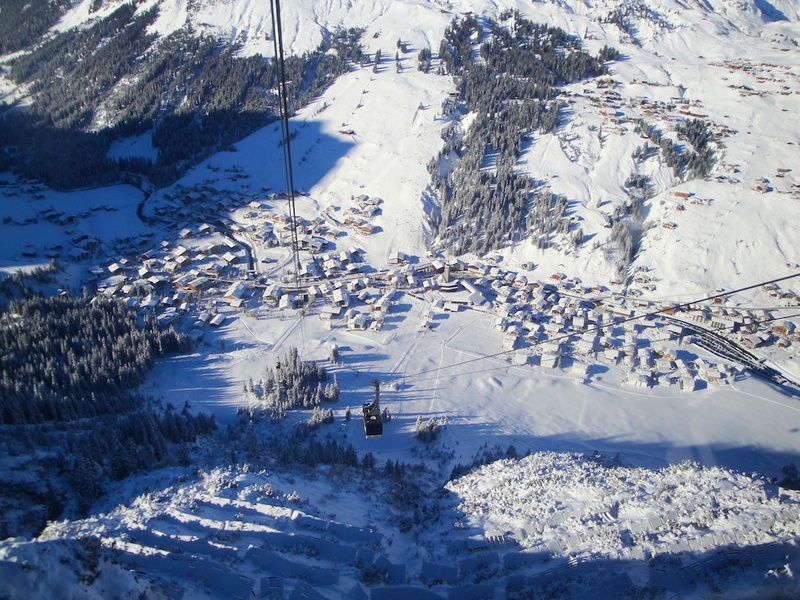 Looking out to my left, I felt equally excited and terrified – I was sitting on a chair lift up to Kriegerhorn (2173m), Austria, watching the pros slide down a steep mountain. So graceful, so confident – so fearless. Weeks before, I had spent a day browsing through winter sports apparel in London – convincing myself that, to ski well, I required the perfect equipment. I watched videos, trying hard to remember what I had to do with my weight in order to make a turn. 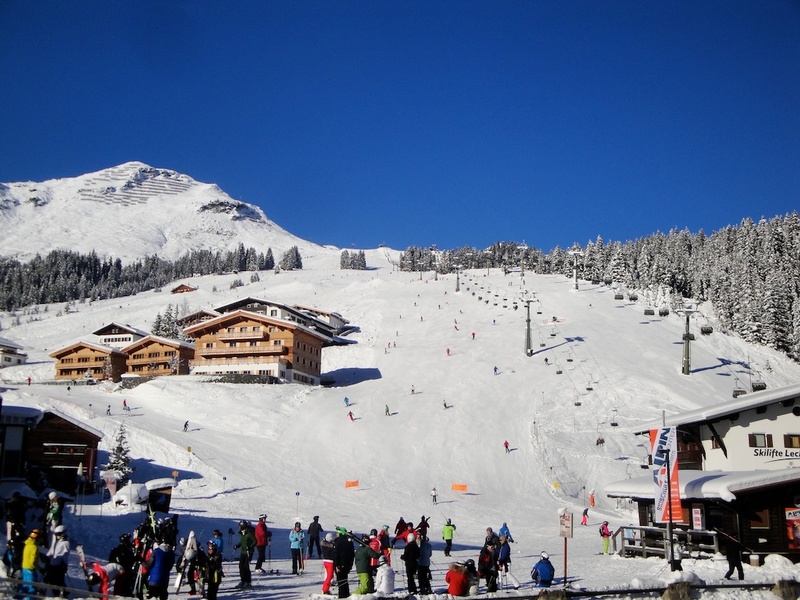 I wanted to hit the pistes skiing with confidence, like I’ve never done before. 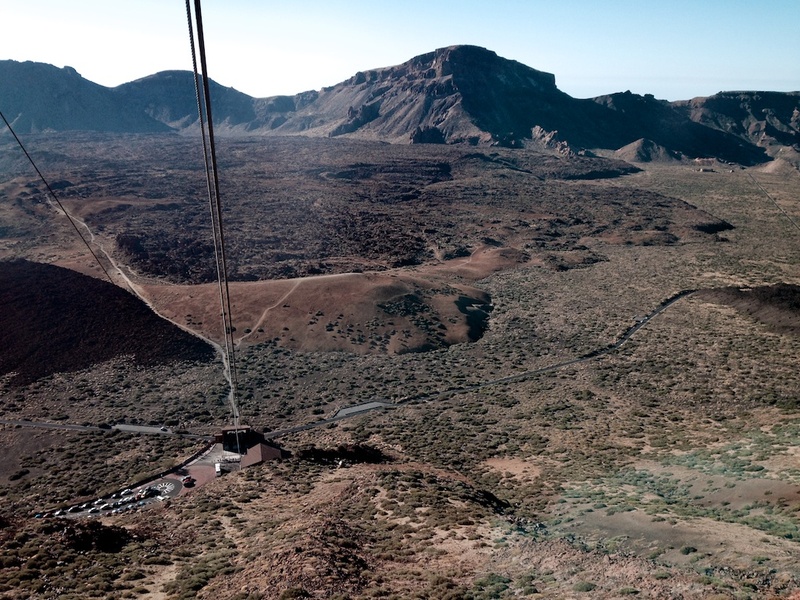 Back on that chair lift, though, I began to have my doubts. Hmmm… Visibility isn’t that good, I need to go extra slow. But wait, this is getting a bit too steep for me. Oh, look how fast they go! I can’t control my speed that well. Heck, I can’t even turn that well! What am I doing? What was I thinking?! Can you please take me back down again? I have a secret: I’m afraid of falling (ok, so it’s not that much of a secret anymore…). 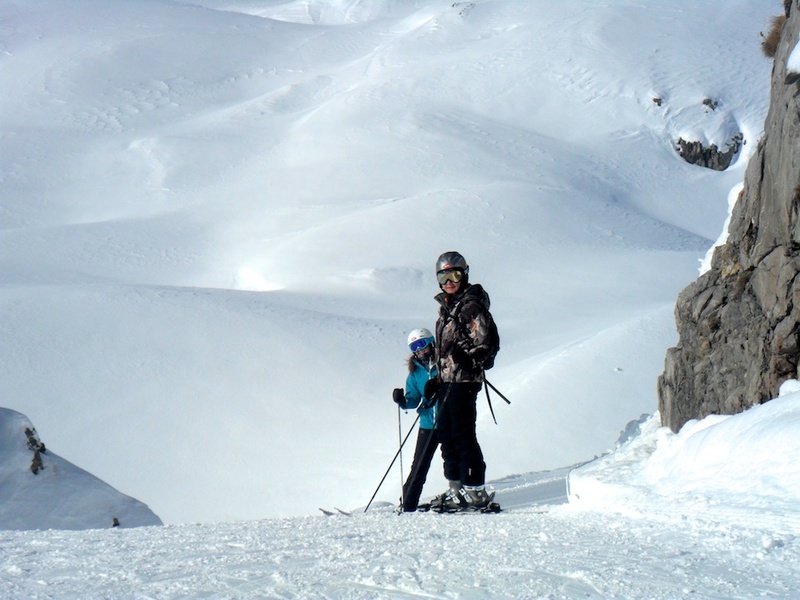 The truth is, whenever I am faced with a steep slope or a narrow uneven path (whether I’m on skis or just on my own feet), I have the feeling that I may loose my balance. I recognise the pattern: my heart beat accelerates, my breathing quickens and overall I feel tense. In the worst cases, though – I am literally paralysed. It might only be a few seconds or it might be 10 minutes. All I know is that to me it feels like a lifetime. I should limit my activities to snorkelling and sunbathing (both of which I love, too). But I can’t. I love the outdoors – particularly mountains. And volcanoes. 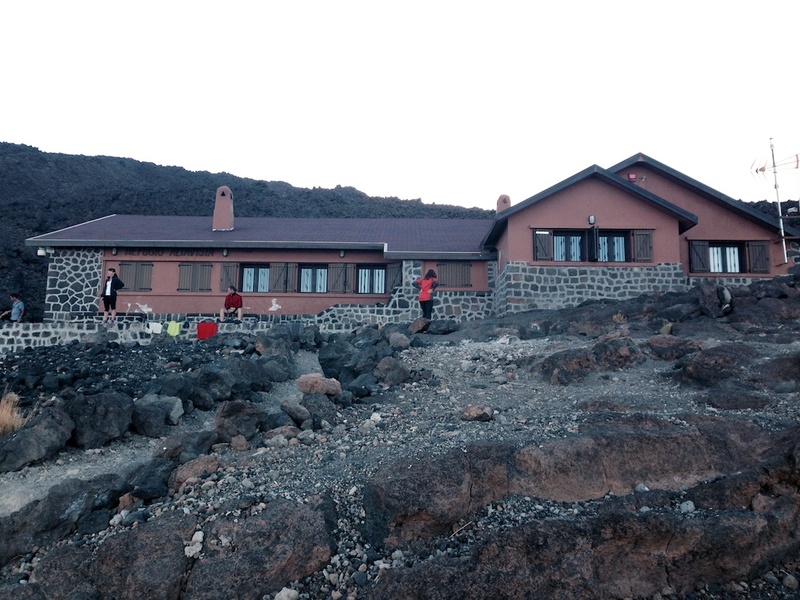 Oh, and challenging hikes around mountains and volcanoes! While it hasn’t always been easy, I constantly aim to challenge my irrational fear of loosing balance and falling. The thought of all the breathtaking views and unforgettable experiences that await at the top of those mountains give me enough courage to break through my limiting thoughts and reach higher. So, back on the chair lift in Austria, I could have let my thoughts send me back down the same way I went up. But instead, I gracefully got off the chair lift with a heart that felt like it was going to jump out of my chest and fall down the mountains all by itself any second. 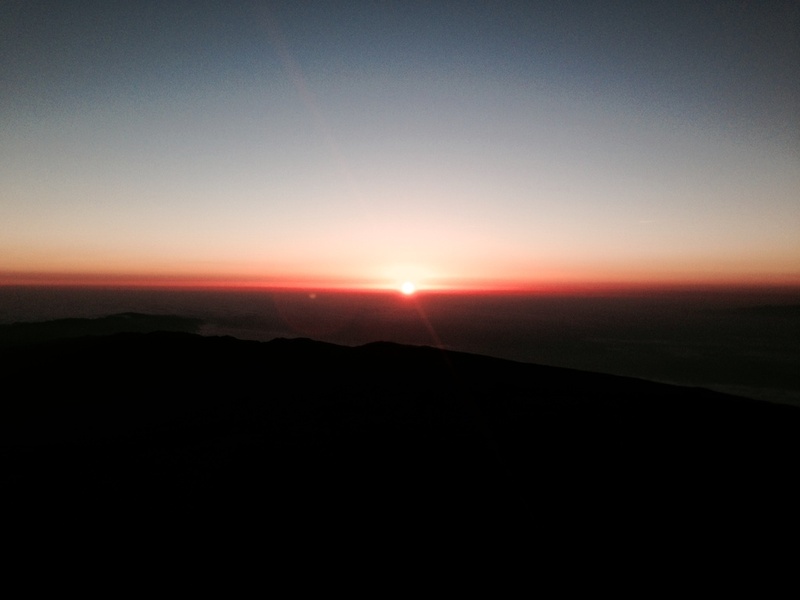 I moved slow – so slow that sometimes it felt I was actually skiing up the mountain, not down. But I kept on moving – and each time new scary thoughts came into my mind, I tried my best to imagine a mental door and let them go. I’m not going to lie to you and tell you that all went great on this trip. I did fall (not as often as I expected) and it was embarrassing (specially that one time I lost both skis!). I twisted my wrist trying to get up again after falling into deep powder snow (which, otherwise, is more fun that Christmas itself!). And I froze of fear. Once. It wasn’t pretty. But you know what? I got over it. Note: see the goofy girl in blue over there? That’s me getting over it. What I learned from this trip is that skiing might be a lot about technique – but a lot of it is trust, too. Trust in your equipment, your skills and your balance – but over everything else: trust in yourself – specially when the scary gets particularly tough. 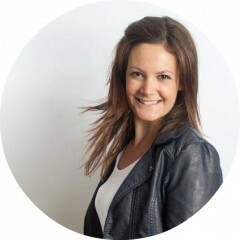 Getting gutsy for me is precisely that – trusting myself when it gets challenging. Pushing myself to the limit, getting uncomfortable and constantly confront my fear of falling. It’s beyond bravery. It’s daring to go ahead in spite of the doubtful part of my conscience. It’s doing something that scares me. 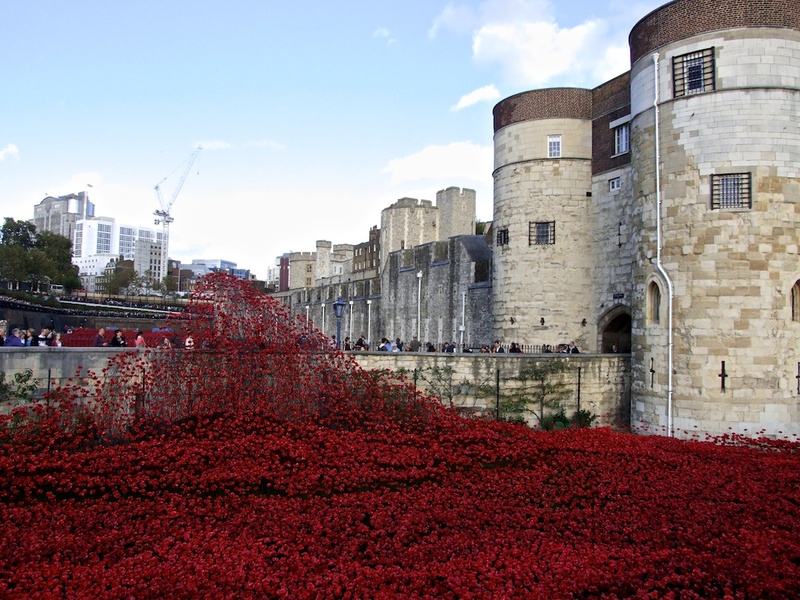 Over the past months, the Tower of London has been transformed into a red sea of hand-made ceramic poppies to commemorate the start of World War One. 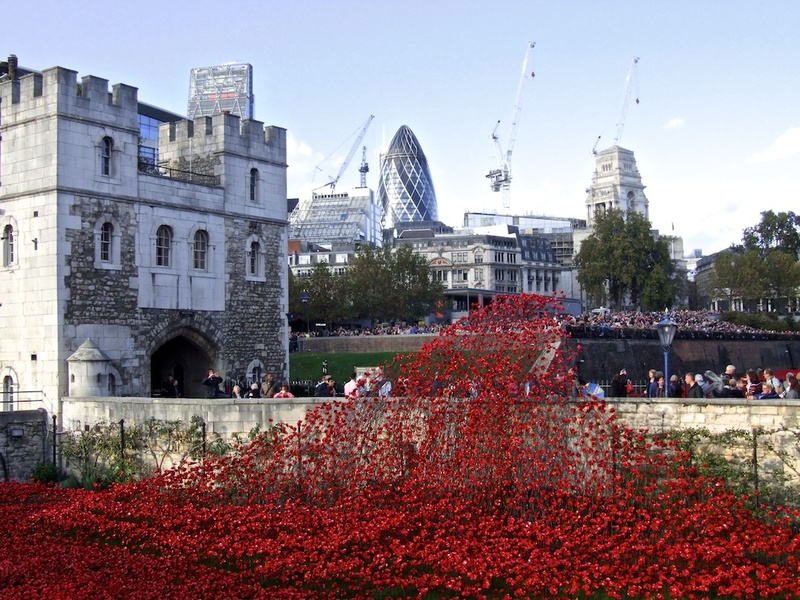 The first poppy was planted in July – ever since, 16,000 volunteers from across the World have donated their time to help plant the 888,246 flowers – each of which represents a British or colonial life lost during the war. The evolving installation by ceramic artist Paul Cummins and set designer Tom Piper has a remarkable theatrical effect. 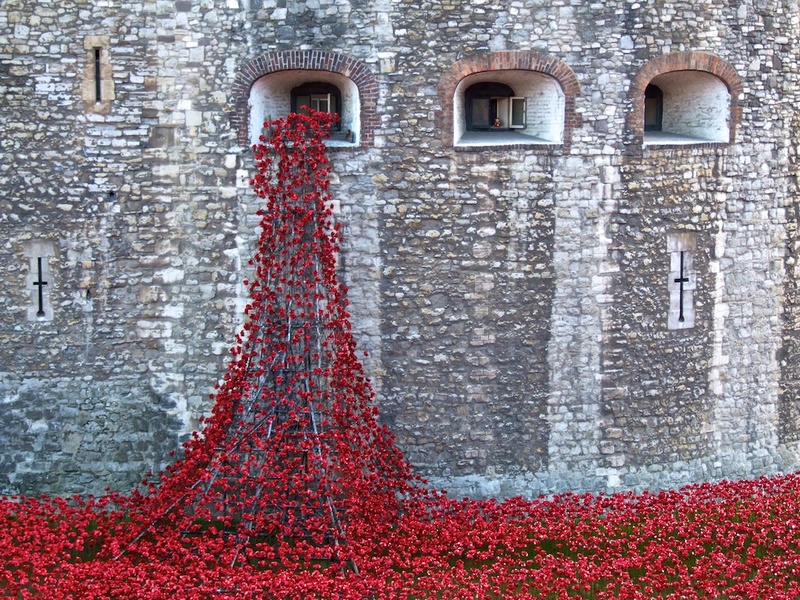 I felt overwhelmed by the number of flowers filling the moat and moved by the flow of poppies pouring over the walls of the tower and out its windows. 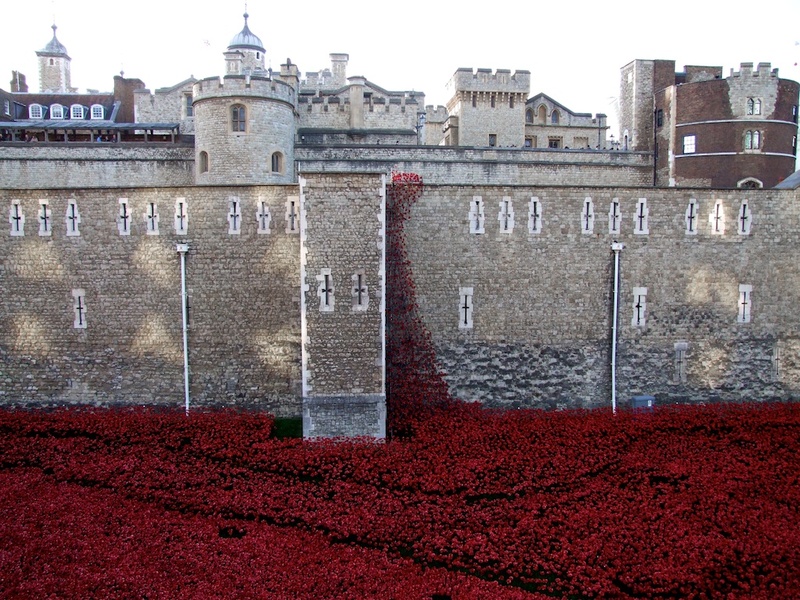 It really provides a sense of perspective to the vast consequences of World War One (or, any war, really!). Sure, the installation only commemorates the loss of british allied services’ lives, but the truth is – any life lost to war is one life too many. I can’t even imagine how the installation would look like if we added all +16 million lost lives, regardless where they came from. 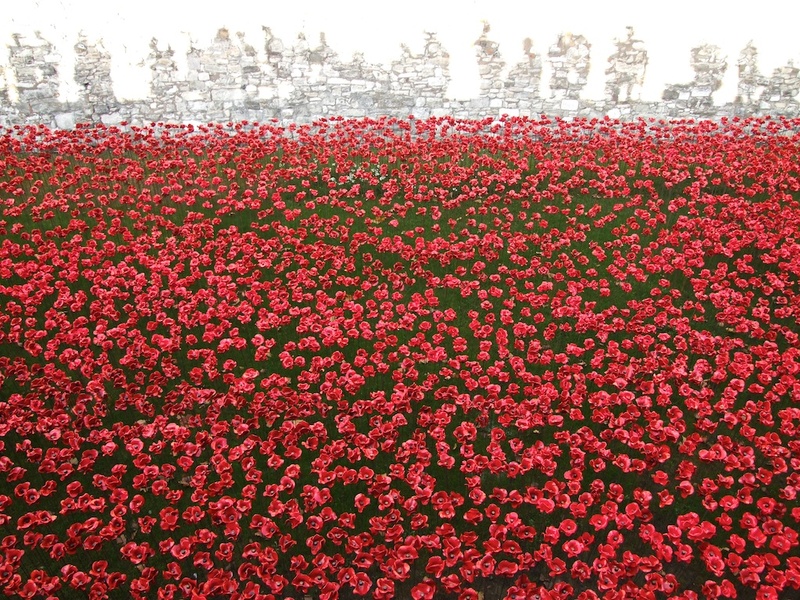 Each poppy has been sold to the public for £25 each, with a share of the proceeds going to six service charities in the UK – and they’ve already been sold out! 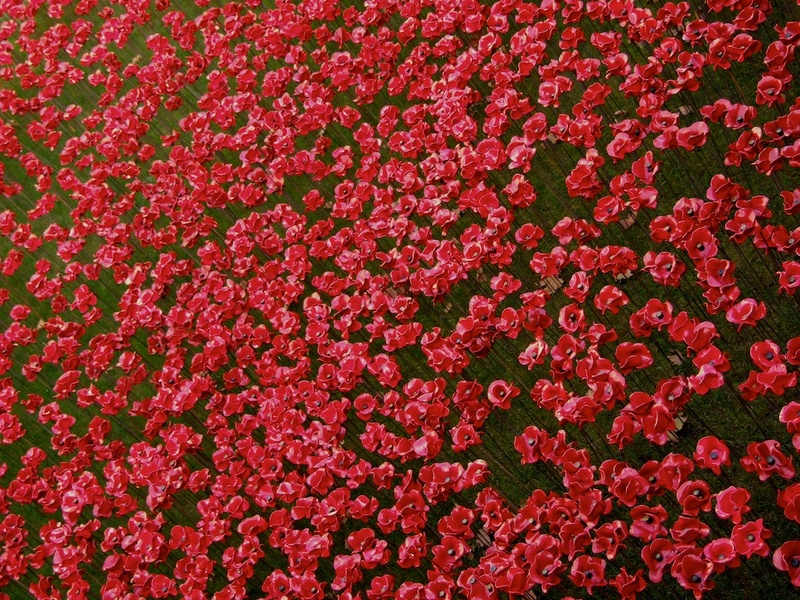 The last poppy will be planted on the 11th of November, Armistice Day. 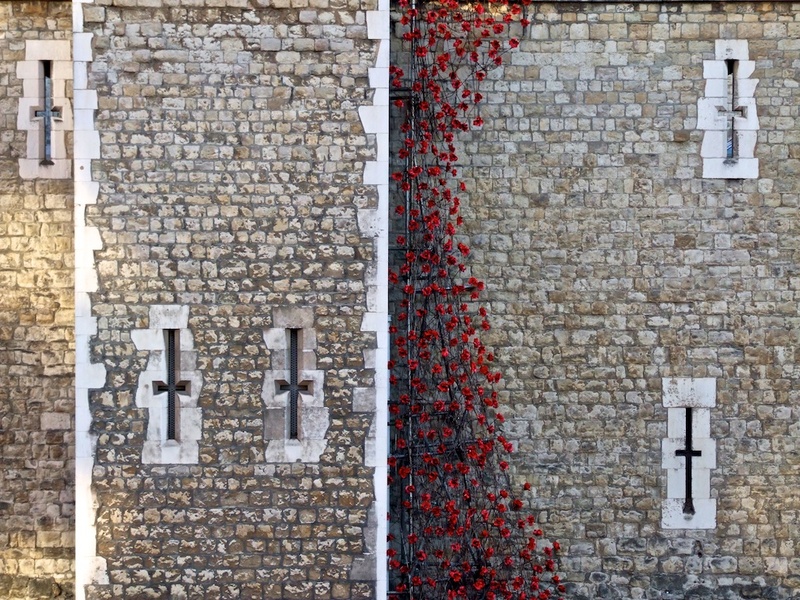 If you’re in London before this day, I strongly encourage you to pay a visit this installation – it truly reflects the magnitude of this event. I’ve got a confession to make: I’m a terrible tourist. I rarely read about a place before I go. I hardly ever travel with a map or a guide. And most of the time, I’m too impatient to queue for an hour to visit a local attraction. 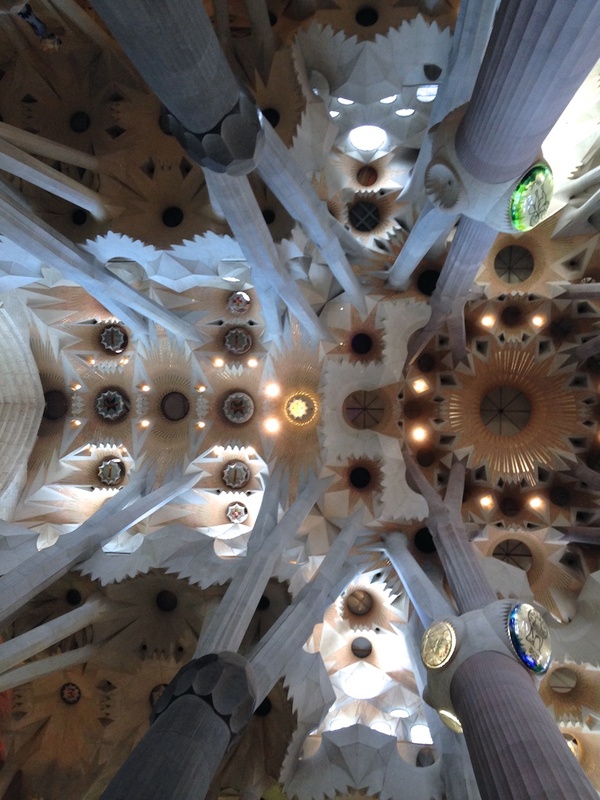 During my 4 months in Barcelona, I genuinely skipped most of the city’s must see attractions, and instead chose to explore the city’s streets and neighbourhoods, its traditions and gastronomy as well as its gorgeous natural surroundings. But a tiny part of me felt like my stay was incomplete. You see, it’s hardly impossible to talk about Barcelona without giving mention to its architectural masterpieces. 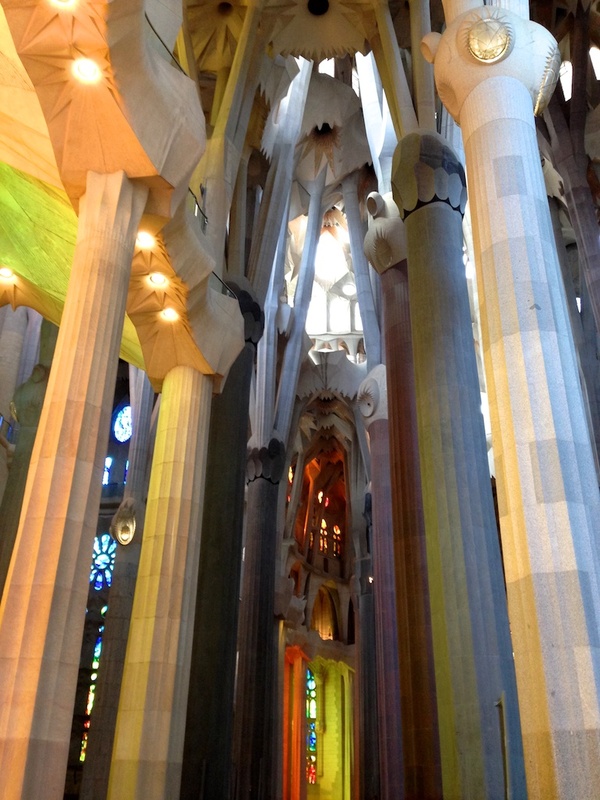 As an architecture enthusiast myself, my short time in Barcelona was heaven. 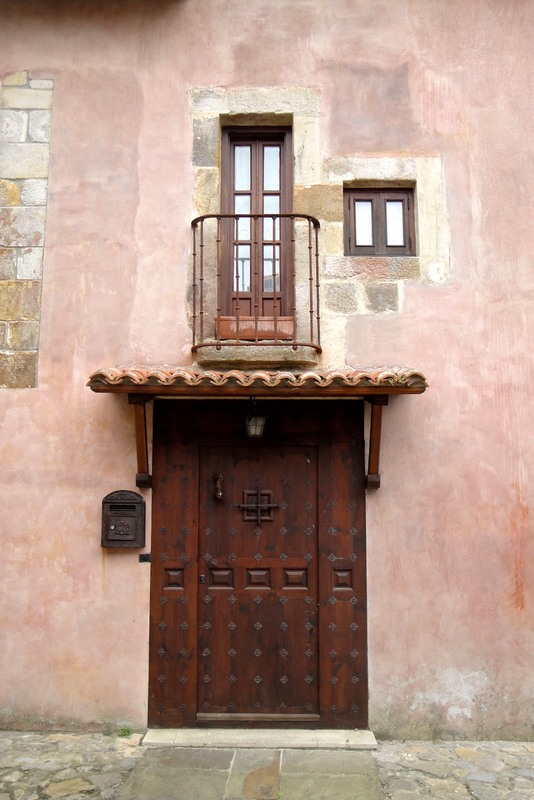 Every day, I walked for at least an hour and absorbed the magnificent details of the façades. 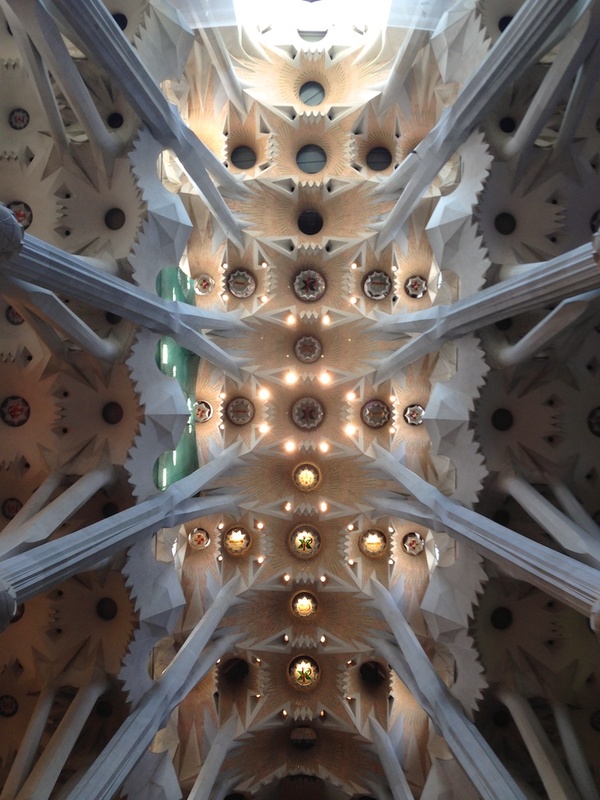 Every now and then, I came across one of Gaudi’s many creations. 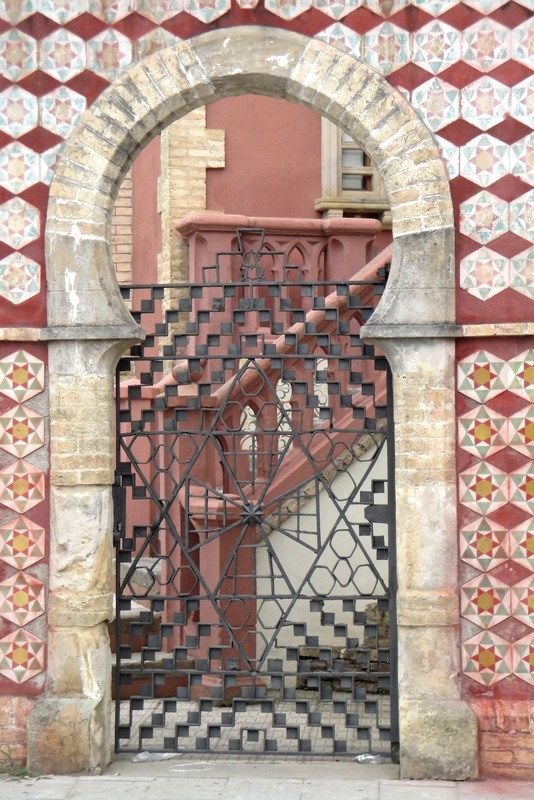 For those of you who may not have heard of him, Antoní Gaudí is one of the city’s most celebrated architects. 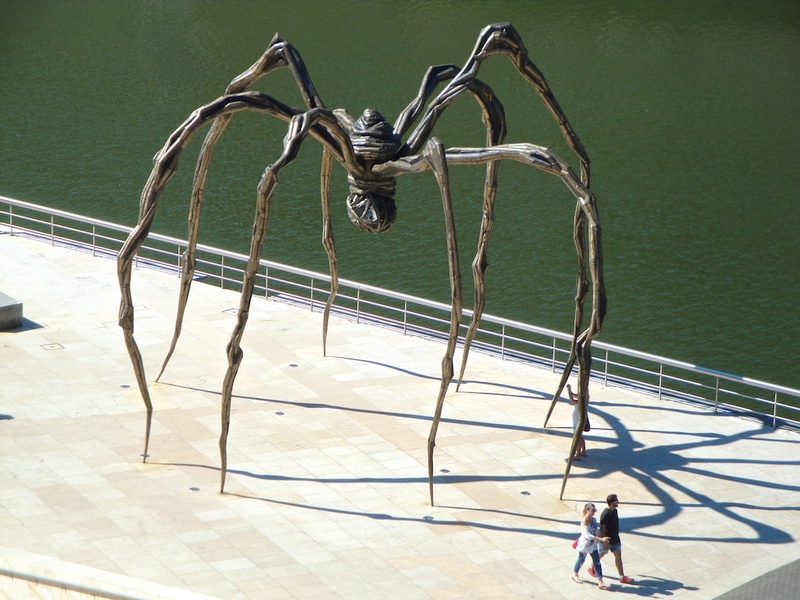 His work was strongly influenced by his 3 passions: architecture, nature and religion. I loved examining his art from the outside, looking for evidence of his influence in its details. 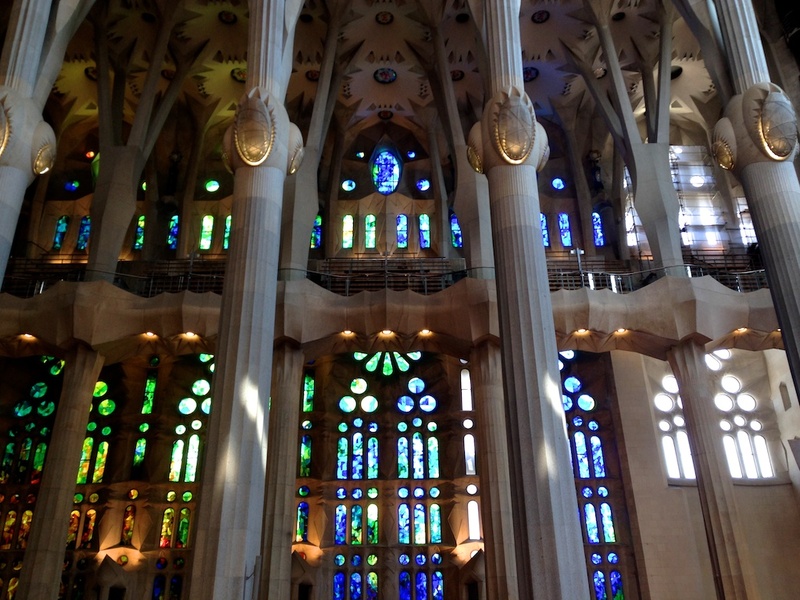 I have always been most intrigued by Gaudí’s masterpiece, La Sagrada Familia, not only because it’s Spain’s most visited monument (despite of it still being work in progress), but because he devoted more than 40 years of his life to this project. Just imagine the amount of thought and detail he put into it! But each time I attempted to join the queue at the temple, I grew impatient and eventually left to pursue something else (like, sipping fresh orange juice on my favourite roof top). 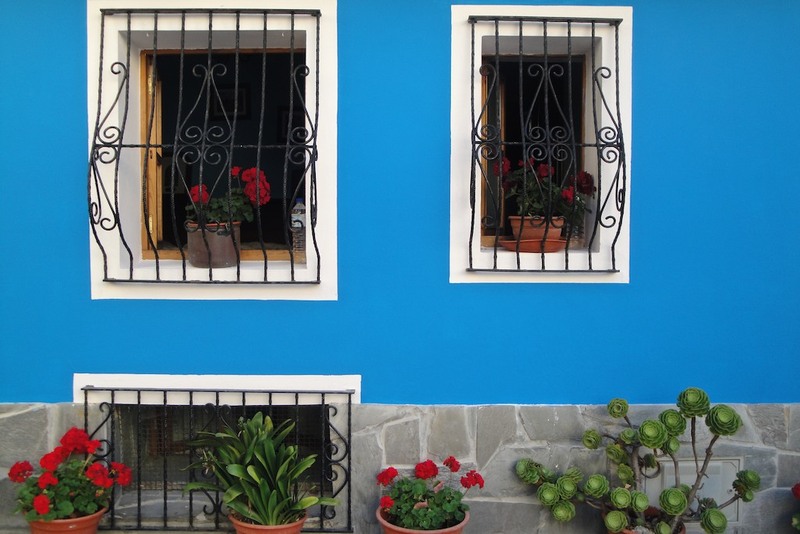 After all, I wasn’t a tourist – I was an expat. Returning to Barcelona as a tourist one year later has given me the chance to see the city differently. This time I had no commitments, no errands to run, no sunshine to catch up with. 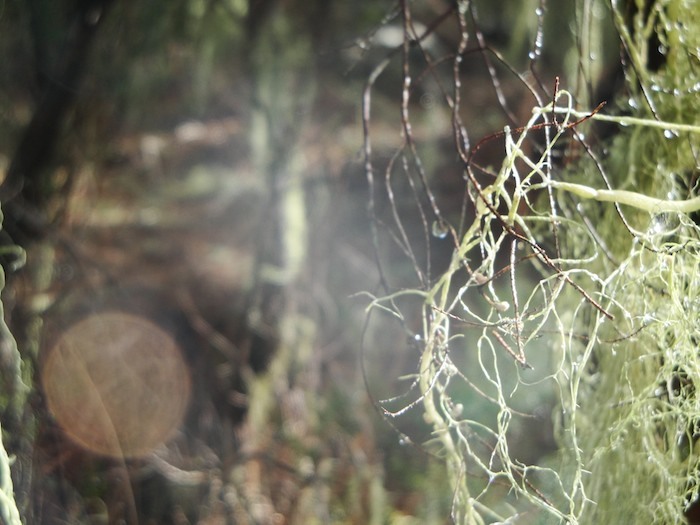 Standing in the main chamber looking up to the ceiling transports you to a majestic forest, with its shades and occasional light pouring in through small holes. 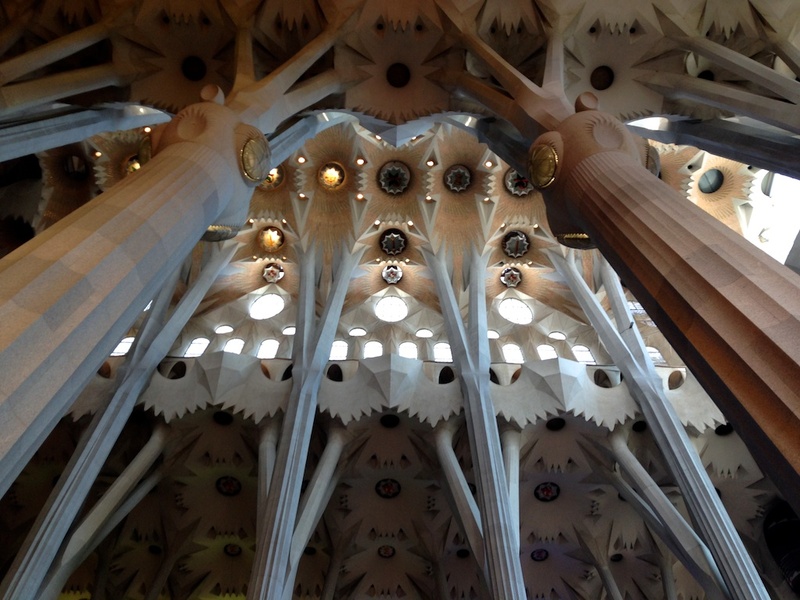 Gaudí created this forest by developing his columns into tree branches as they reach the ceiling. Throughout the Church, you will also find turtles supporting the bases of these tree columns and spiral staircases recreating the shape of a snail’s shell. But my favourite detail was the colourful reflections of the sun shining through the stained glass – absolutely gorgeous. 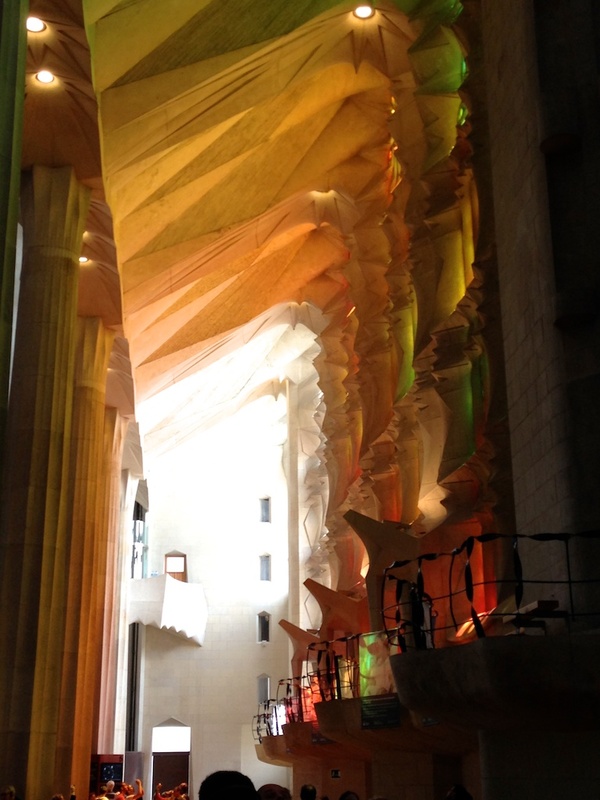 Visiting the Sagrada Familia was one of my favourite activities during our long weekend in Barcelona. Queuing, it turns out, was totally worth it! 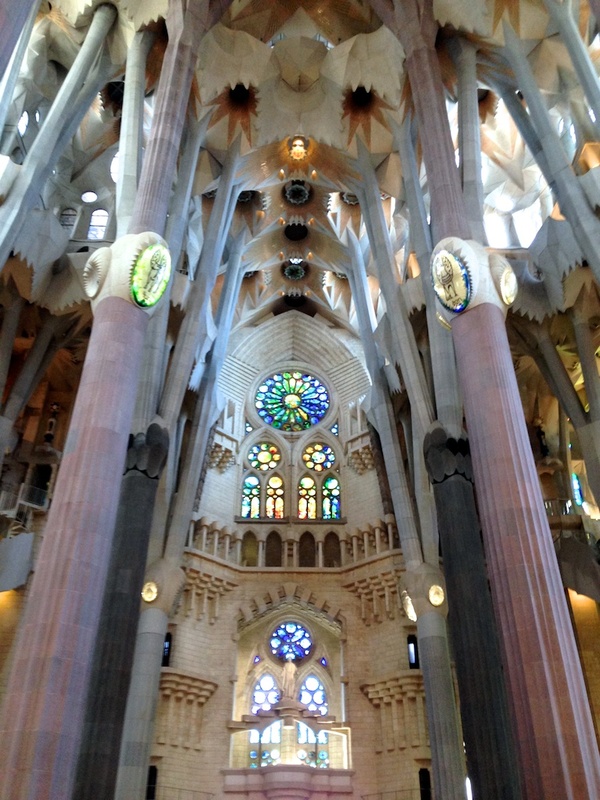 Have you been to the Sagrada Familia? As much as I like to cozy up next to a fire in a warm gastro pub in London, I was very much looking forward to be able to trade my layers for a bit of sunshine. Scratch that – if there was one thing I was determined to do in Lanzarote, this was sunbathing. Every. Single. Day. Yes, I would need a lot of sunshine for that. 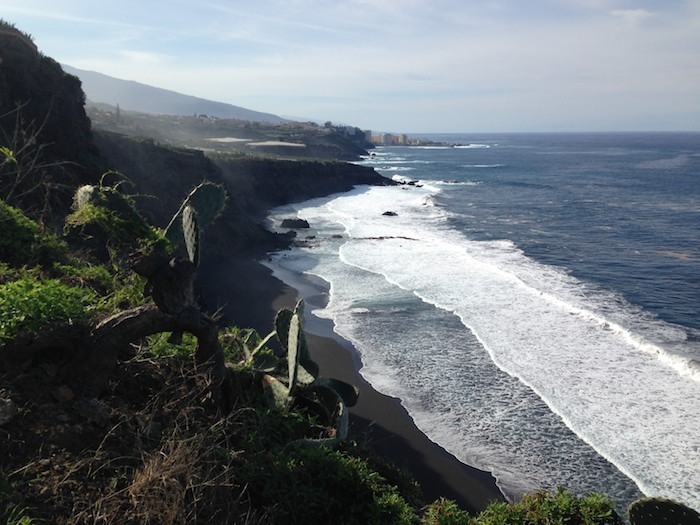 Of course, as someone who grew up in the Canary Islands, I am well aware that even Europe’s year-round beach destination can’t guarantee impeccable weather – specially not in February. So every day until the day we flew south, I wished for uninterrupted sunshine at our arrival. And as we arrived, we realised that for once, weather was on our side. With an average of 23-25ºC during the day, we woke up early to stretch our time out in the sunshine. We lunched on sunny terraces overlooking the sea and spent lazy afternoons drinking cold gin tonics next to our pool. 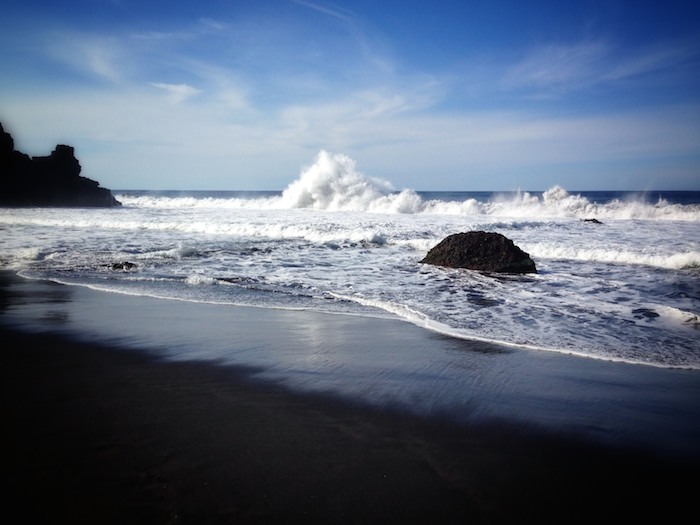 And then there was the day we visited Playa Papagayo. Playa Papagayo, hidden away in Los Ajaches Natural Reserve, is a crescent of natural white sand protected by rocky cliffs. 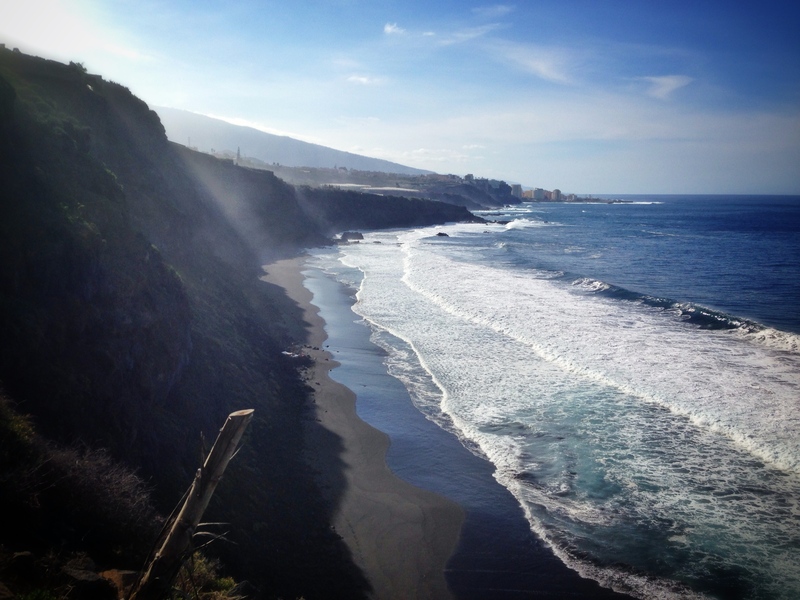 It is said to be one of Lanzarote’s most beautiful beaches – and I have no doubt about it. 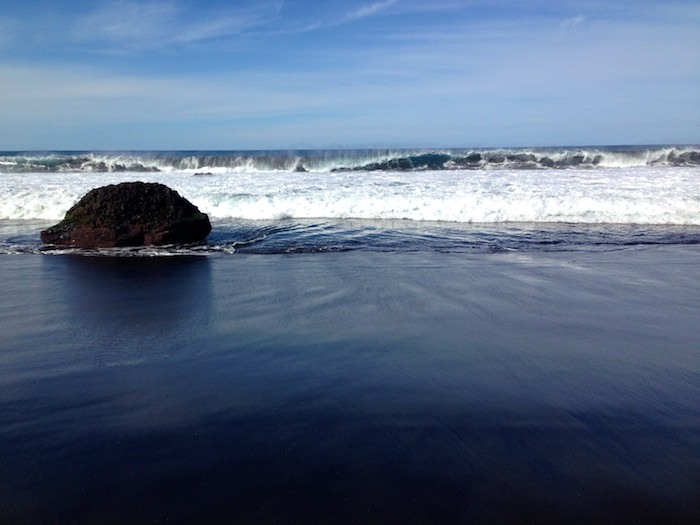 The entire island boasts a lot of natural (and unconventional) beauty because of its volcanic nature. During the 18th and 19th centuries, a series of eruptions created over 300 new volcanic peaks which can be found spread around the small island. Its volcanic nature also accounts for the different colour layers in its earth – ranging from black to red to almost white. While we did sunbathe (a lot) in Papagayo, I’m an antsy pants and can hardly ever hold still for more than half an hour, so I set off to explore the surroundings. Playa Papagayo might be the best known beach in the Natural Reserve, but it’s got some tough competition out there. It’s neighbouring beaches Playa Mujeres, Pozo, Congrío and Muelas, all compete with its beauty. Their further distance from the main car park and lack of beach hut serving cold drinks guarantee a much quieter stay away from the tourists. 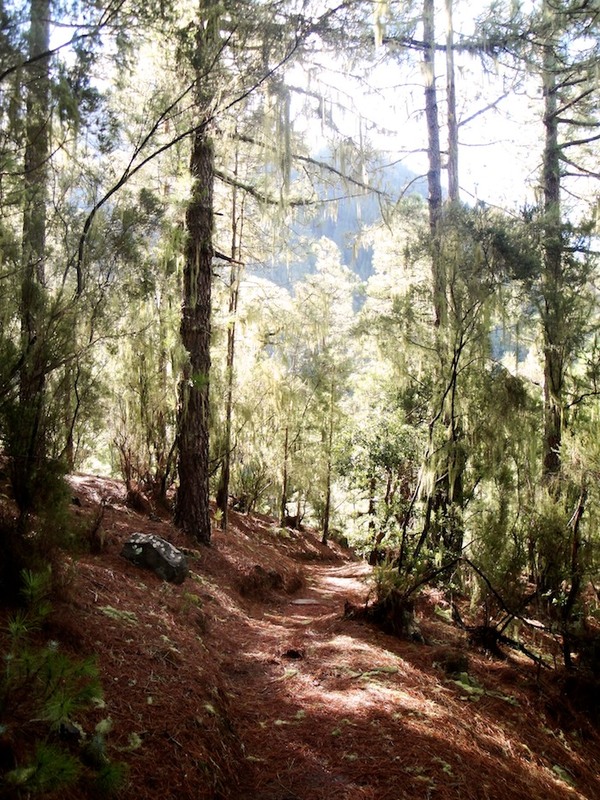 Practical Information: There is a 3€ charge to access Los Ajaches Natural Reserve – but believe me, it’s well worth it. 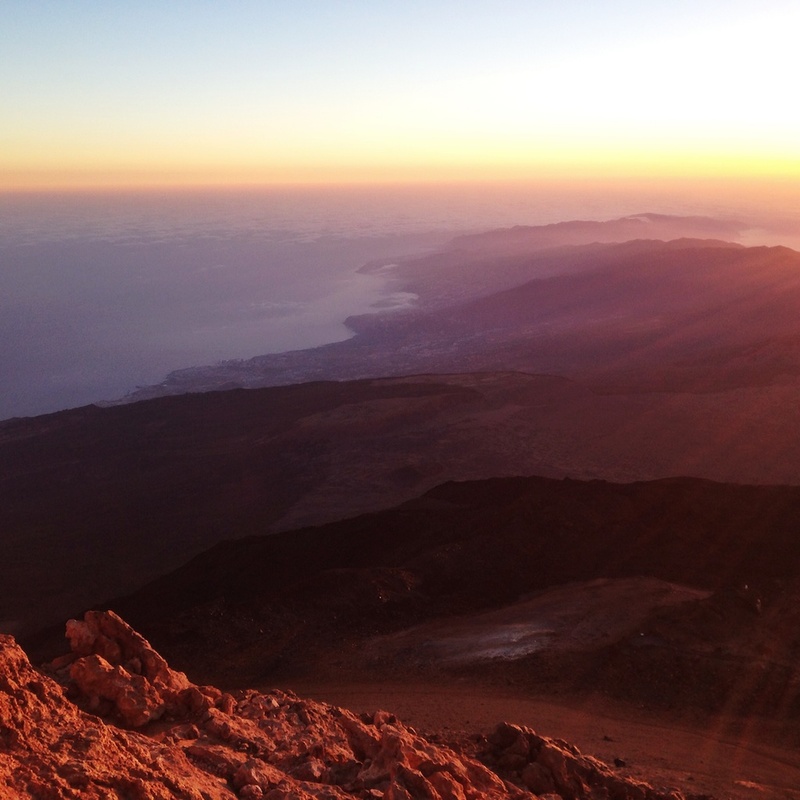 While others might study the beach possibilities, I researched the best hiking adventure in Lanzarote. 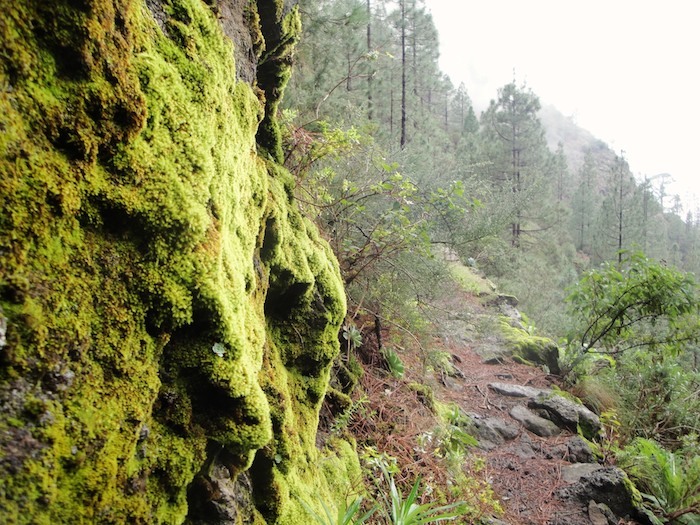 And by the best, I mean one that includes lava fields and volcanoes without requiring advanced hiking skills, an excellent condition or two cars on two ends of a trail. I chose Canldera Blanca because it was short, didn’t require alpine boots but still seemed to offer an authentic volcanic experience. 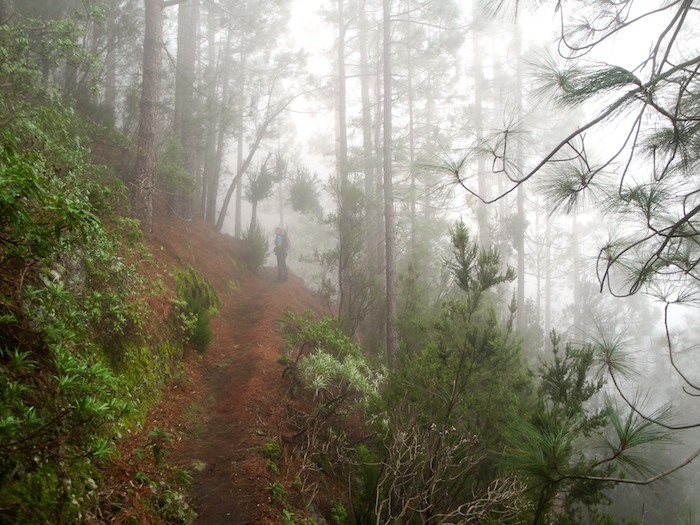 And I don’t regret the choice – it was probably the easiest most rewarding hike on the island! The starting point is a car park close to the tiny town of Mancha Blanca. Following the signs, we spent the first 45min or so walking through a lava field. 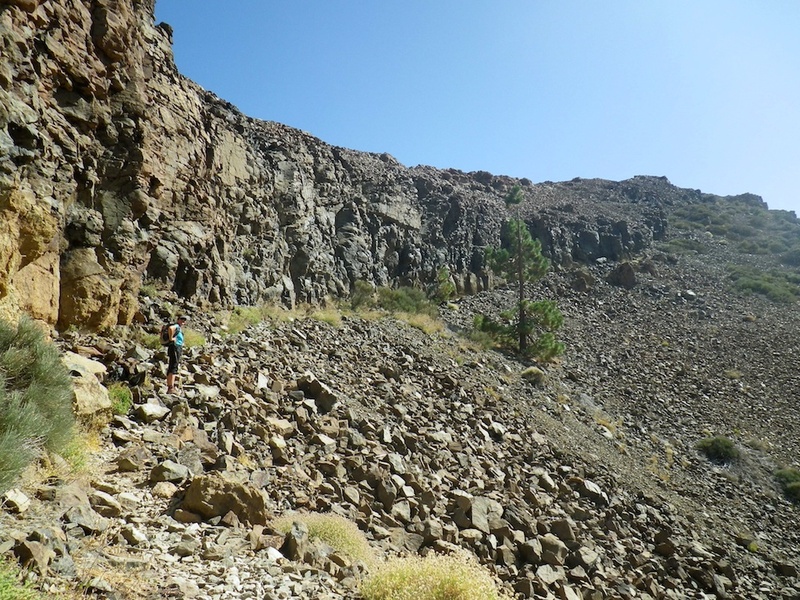 While this part of the trail doesn’t offer any views, it’s still an interesting walk – we inspected the lava stones and glimpsed into the inside of a smaller crater (Montaña Caldereta) on our way. 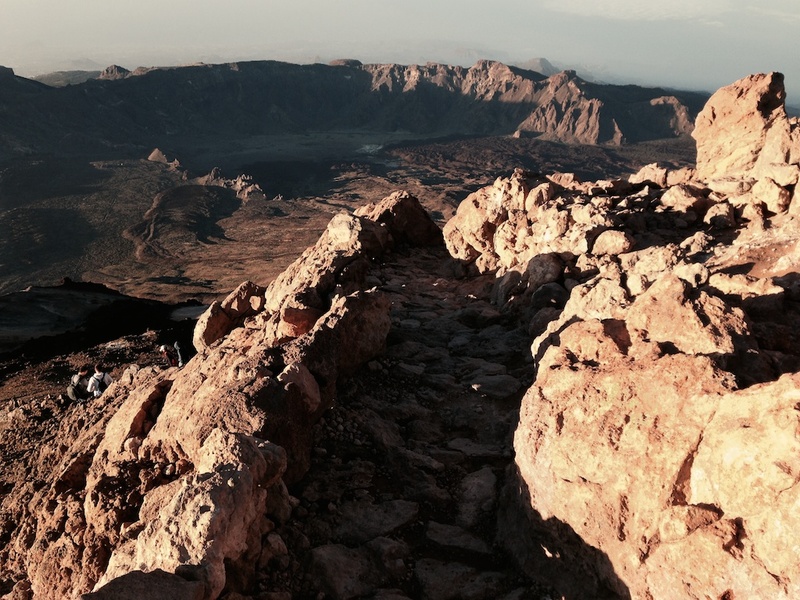 Once at the bottom of Caldera Blanca, we faced a gentle diagonal climb and soon reached the top of the crater. We turned to the left to walk up to the summit, from which point I believe is a descent back to the bottom of the crater and I also spotted some more adventurous hikers walking round the crater in the distance. Unfortunately it became very windy and decided to return via the same route we had come up (safety comes first!). Elevation gain uphill: 300m approx. Elevation gain downhill: 300m approx. 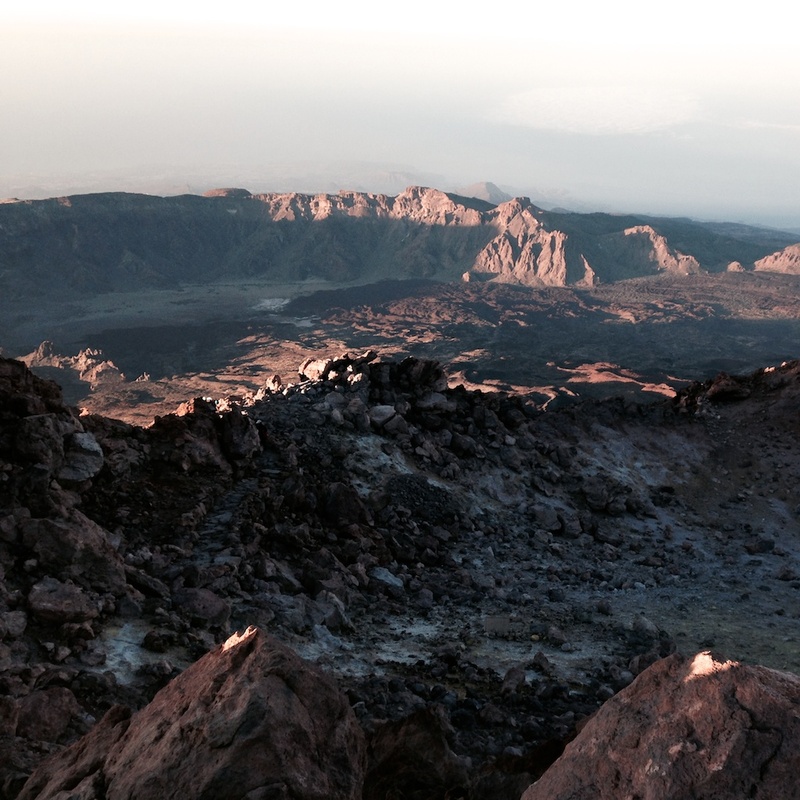 Wikiloc: Caldera Blanca – Lanzarote (This one is the trip around the crater). London wears many personalities. 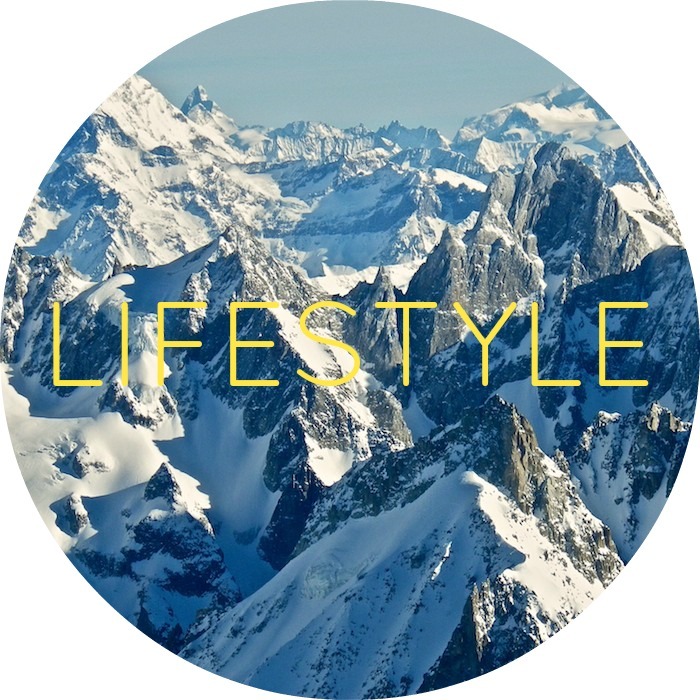 It’s quirky, glamorous, grumpy, lazy, competitive and adventurous. And even though I understand when friends tell me that they could never live in this city, a part of me can’t avoid thinking that they simply haven’t discovered their London yet. 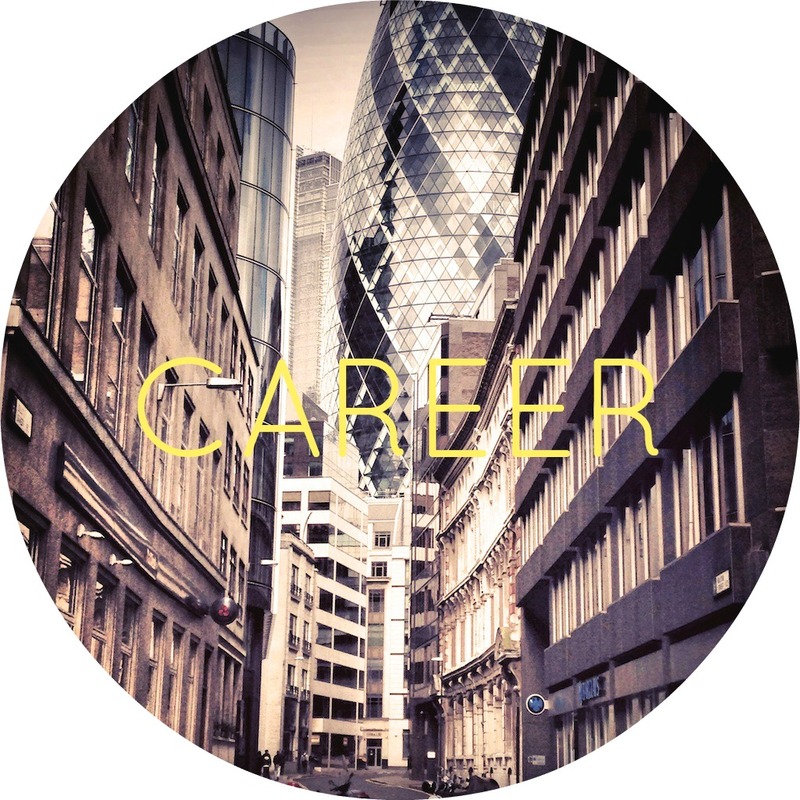 Moving to London was my ultimate challenge. 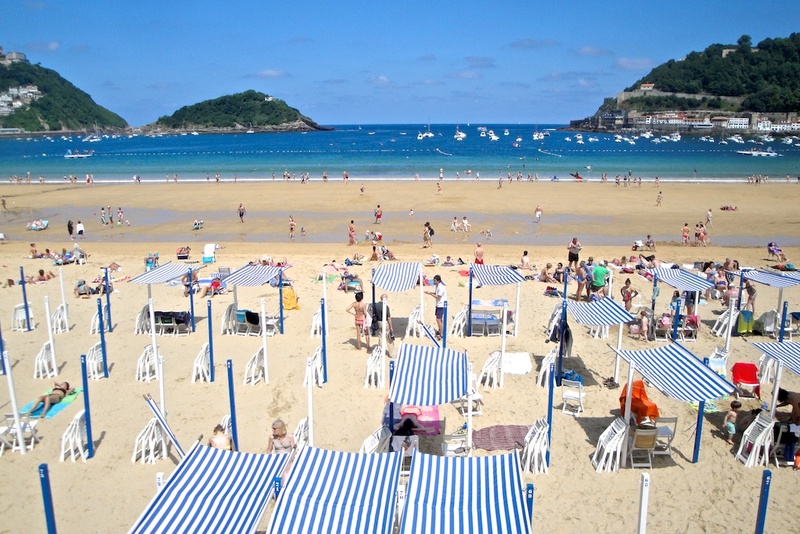 Having grown up in Europe’s mildest climate, a mere 10 minute walk from the beach – it has been a constant push for me to adapt to the changing seasons in Madrid, the cold, snow and punctuality in Switzerland, and the anonymity, large distances and sudden never-ending choices of London. I am now close to celebrating 2.5 years in a city that has been nicknamed the old smoke. A city that, to me, is rough, grumpy and chaotic, but equally stimulating, exciting and strangely familiar. It’s cozy but trendy; vibrant and ambitious. All to be expected by a cosmopolitan capital. But then, it’s also local, green and wild. I don’t need to go far to land in a park or even a forest – Richmond Park being one of my favourites. Richmond Park is a Natural Reserve and English Heritage located south west London. Back in 1634, Charles I created the space to become a deer park to satisfy his hunting. Today it has become the second largest urban walled park in Britain with over 600 deers that call this park home. What I absolurely love about this open space is how far it transports you from all the hustle and nuzzle of the big city. Even though I occasionally spotted other visitors (Richmond is a popular destination for runners), I hardly crossed paths with anyone else. Well, except for these cuties! 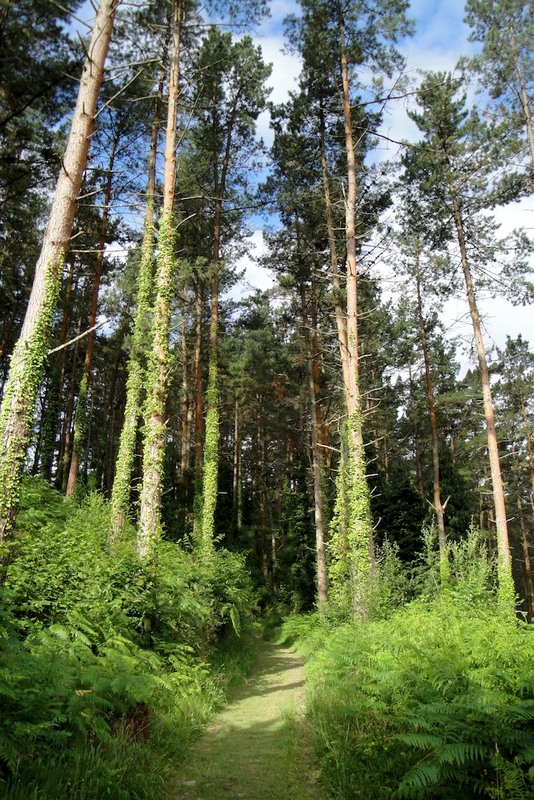 The park stretches over 2.300 acres with a perimeter of over 20 km and has an ancient forest with nearly 1.000 oak trees. I ventured into the woods, fascinated by the warm leaf colours. I could only hear the sound of a light breeze through the trees, rustling the leaves. I didn’t stay long in the forest because, well, I had read too many thrillers. To compensate, I left to search for the red deer herds that can be found in the park. It’s great to be able to get up so close to them, although this requires a certain degree of patience and ingenuity – and a lot of memory space on your camera! So, while for many London is busy, chaotic and expensive – I like to think of London as open, wild and diverse. That’s my London. It’s what I go back to whenever I feel the city is fighting against me. It’s what kind of makes it feel like home. Have you been to Richmond Park? Which would be the 3 words that define London to you? …Also known as: My first taste of a 2* Michelin Restaurant. I had never heard of Olot before. Was there anything exciting to be seen around here? 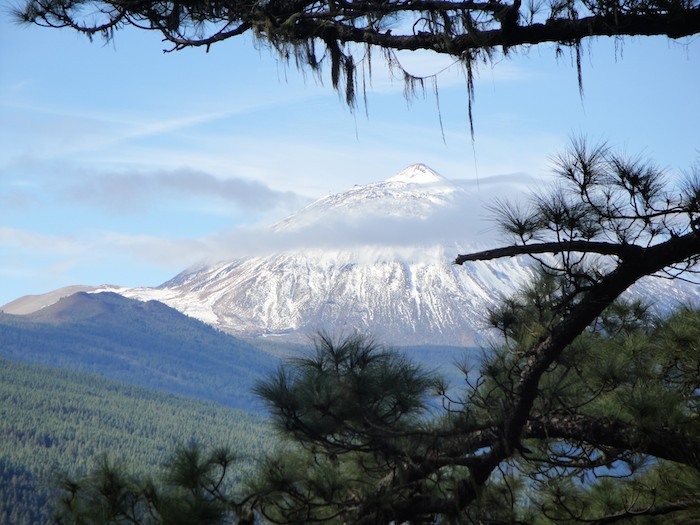 Sure, it’s a region with plenty of small volcanoes, which makes for easy day hikes. But was that all? On our first evening, we went to the (a bit spooky) hotel’s reception and asked for a dinner recommendation close by. 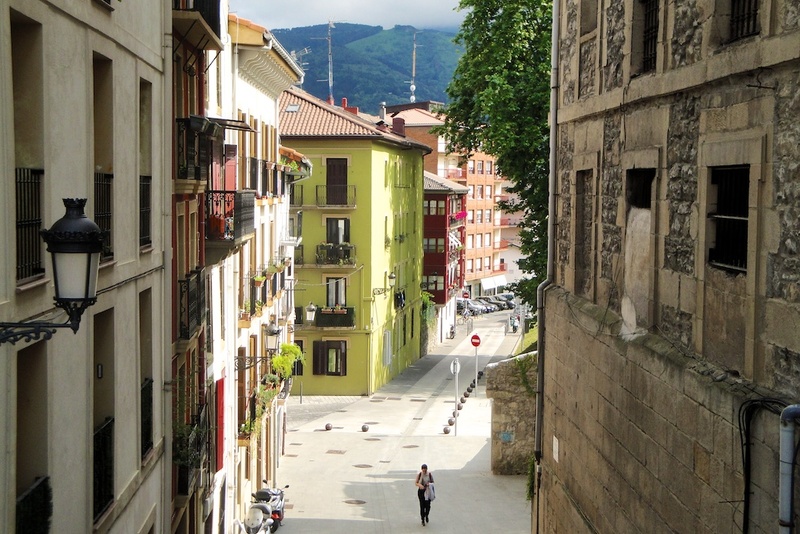 Receptionist: You came to the right place for food – Olot has some of the best restaurants in the region. Are you looking for a Michelin restaurant? Receptionist: Yes! We have a 2* Michelin restaurant, a 1* restaurant and plenty of award-winning chefs just a few minutes away from here. Well that would explain it, wouldn’t it? We had arrived at a rural gastronomic haven. What I discovered in this gastronomic and architectural temple was the joy of rural and seasonal cuisine with a tiny twist. A kind of freshness that literally brought food from the garden to our plates. We tasted 18 completely different dishes – each of them sourced locally and created with an admiring attention to detail. This was a feast of more than 3.5 hours. We experienced these local flavours in different environment – starters in their beautiful garden, main courses in their main salon – with large windows opening to the front garden and a glass of sweet wine in the golden room pictured above. The restaurant’s chef, Fina Puigdevall, gave us a backtour of their kitchen facilities – large open spaces with lots of natural light and constant connection to their gardens. For 85 EUR per person, the seasonal tasting menu is highly recommendable. 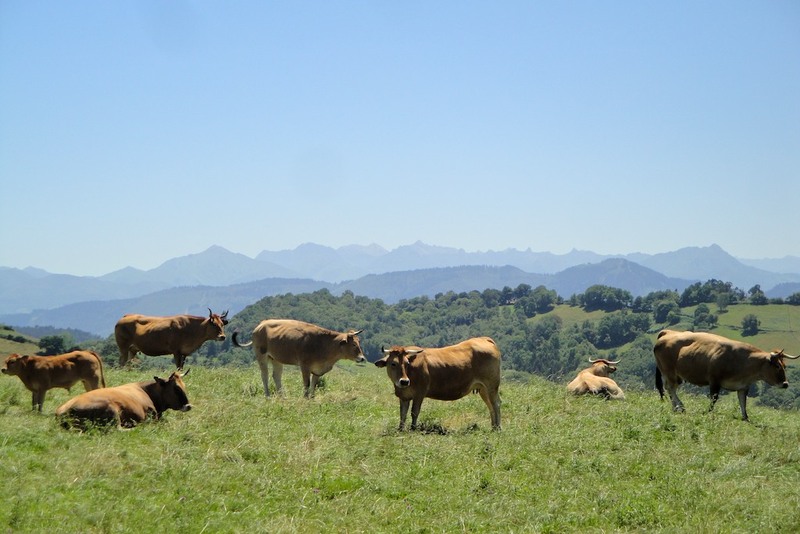 In one seating, we discovered many of Garrotxa’s specialities while treating ourselves to a unique experience! Have you ever been to a Michelin Restaurant?